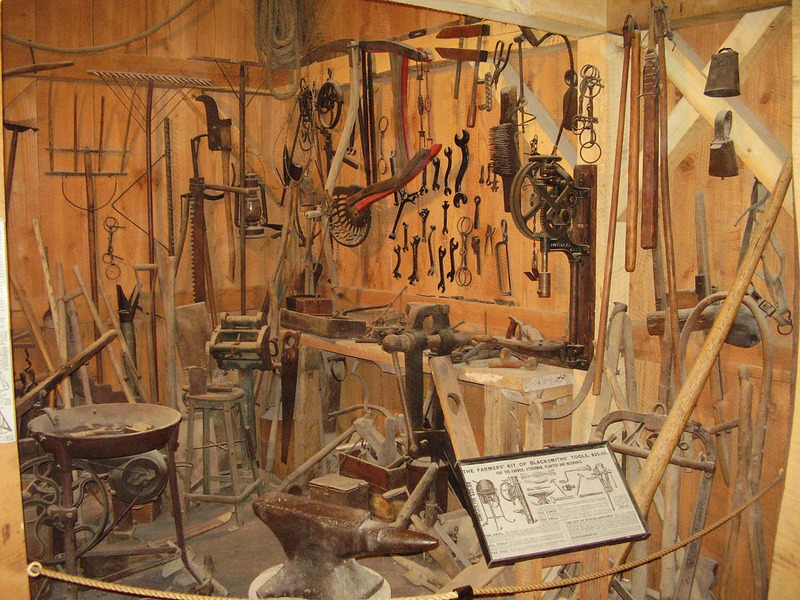 How did farmers and mechanics perform drilling tasks on iron and steel during the early industrial era - before electrical power was common in every home and business? They used a hand-cranked drill press like the post drills shown on this page. No electric motor, no belt power, the drill is hand powered by turning the hand crank. The post drill is supplied with a self-feed mechanism that automatically advances the drill bit into the work while the drill is turning. The post drill is capable of drilling anything that can be drilled by a modern drill press of equivalent size. Post drills were small (compared with the large line-shaft driven camelback drill presses) and easily crated and shipped to any location. Latest update December 27, 2015. Formatting changes and corrections to make page easier to read. Work is nearly complete on the installation of free standing posts to allow the red drill (at left) and the Champion No. 98 (further down this page) to be used as free standing drill presses. This will include new photos and information on converting the post drill to use with modern keyed style drill chucks. Information on building one of these free-standing posts, along with dimensions, will be added to this page soon. 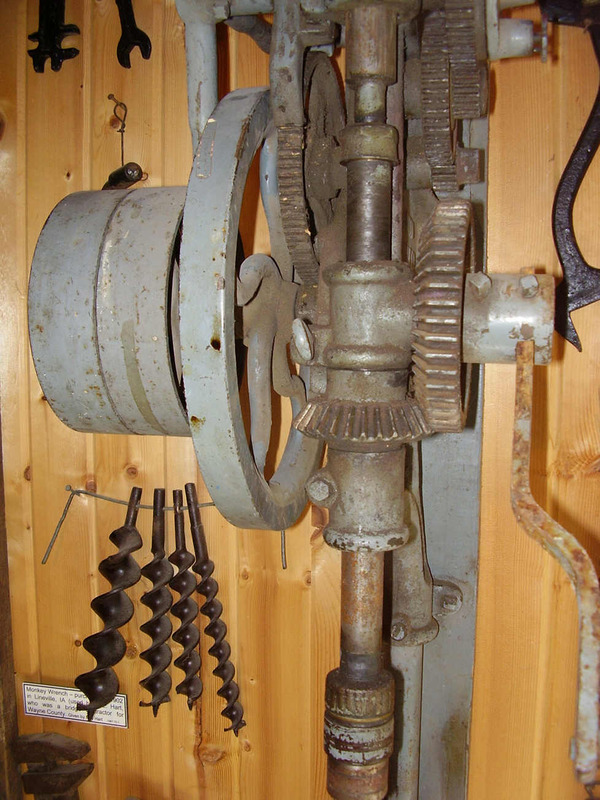 Antique post drill -vs.- the modern drill press. Drilling with a post drill will proceed more slowly and with more difficulty because the mechanic must supply the necessary hand power to turn the drill. Motor-driven drill presses will drill faster and are far less fatiguing to operate compared to a hand-cranked drill. Post drills operate without electricity, modern drill presses require electrical power. About the red post drill shown in this article: This drill (unknown manufacture) is owned by the author (me). It was purchased for $55 at a draft horse auction in Kalona, Iowa, USA, around 1998. The drill was in perfect/new condition and included a modern Jacobs #3B drill chuck with a homemade arbor that was fitted in the original antique screw chuck. The Jacobs chuck that was installed on this drill allows the use of modern (round shank) drill bits. See the photo at left. Straight shank drill bits. Special drill bits, called 'straight shank' bits, were made specifically for post drills. These drill bits were made in many sizes, but all had common shank sizes including 1/2-inch diameter, 5/8-inch diameter, and 41/64-inch diameter. Straight shank drill bits were round in cross section with a flat machined on one side of the shank. The straight shank drill bit was never truly centered in the drill chuck (due to the required manufacturing tolerances between the drill shanks and the chucks) and therefore some drill wobble or runout was always to be expected. 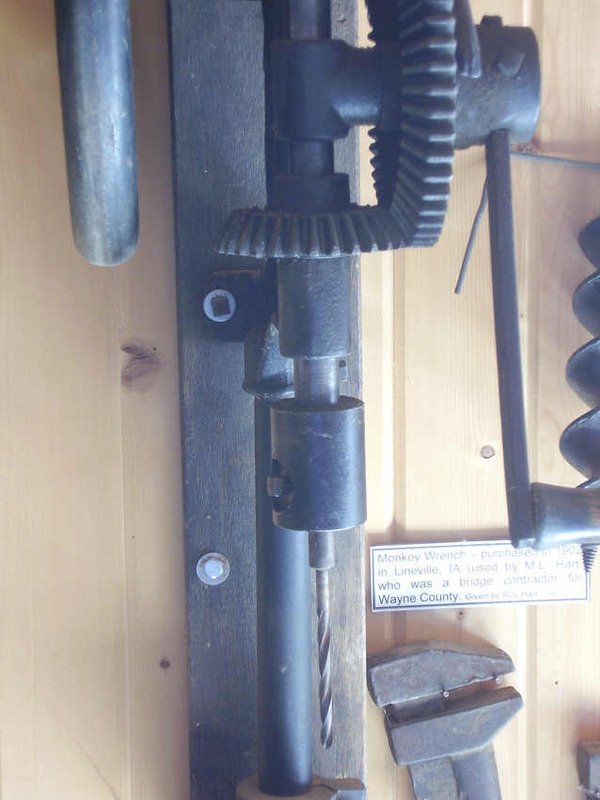 These drills were made for simple manufacturing and repairs in farm shops and small home workshops, where a great amount of accuracy was not necessary. 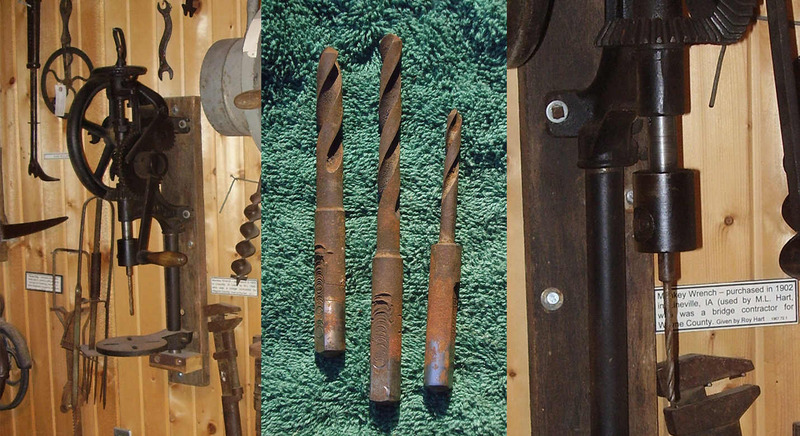 Three antique straight shank drill bits are shown in the photo (at right). Look closely at the drills in this photo; the drills are of different sizes but the shanks are all the same size. The drill bits shown here belong to a friend of the author. Drilling capacity of post drills. Manufacturers advertisements and catalogs often state the maximum size of hole that can be drilled with each model of post drill. As an example, the red post drill shown at top of this page, is rated for drilling holes up to 1-inch in diameter. These drilled hole size ratings are correct but, due to the hand-powered nature of the post drill, maximum hole drilling capacity will actually depend on the physical strength and stamina of the user. Three types of post drill chucks are featured on this webpage; a simple screw chuck, the Champion Blower & Forge 'Never-Slip Drill Chuck', and the Canedy-Otto 'Western Chief Safety Chuck'. These drill chucks were engineered to present no sharp edges or protrusions that might injure the workman while the drills are turning. Antique post drill chucks can be quickly updated to accept modern drill chucks by first installing a small straight shank chuck arbor into a modern drill chuck. Simple screw chuck. The red post drill shown here (photo at right and photo at top of page) was provided with a simple screw chuck. The screw chuck resembles a small hollow barrel with two holes bored in one side, and a set screw threaded into the lower hole. The chuck is threaded onto the drill spindle. The upper hole appears to be a spanner wrench hole - to allow the use of a spanner wrench to install the chuck on the drill spindle. The lower hole was threaded and countersunk to allow the set screw to fit completely inside the body of the chuck - thus presenting no protrusions that could cause injury to the workman while the drill was turning. The drill bit was inserted in the socket of the chuck and rotated slightly to insure that the set screw was pressing against the flat of the drill shank. The set screw is then tightened against the flat of the drill bit shank to hold the drill bit in place and to prevent the bit from slipping during drilling. A small wrench was supplied with the chuck for tightening the set screw onto the drill bits. Post drill chucks were manufactured in 3 common sizes: 1/2-inch, 5/8-inch, and 41/64-inch. This was one of the most common chucks found on many post drills. The Champion Never-Slip Chuck looks similar to the screw chuck described above but, take a closer look, an important feature makes this chuck superior to the screw chuck. What makes the Never-Slip Chuck different from a typical screw chuck is, the shape or profile of the drill bit socket inside the chuck. The drill bit socket is not round, it is instead shaped like the shank of the straight shank drill bit (round, with a flat land), thus providing a solid physical interlock that prevents the drill bit from slipping. The set screw therefore is only needed to prevent the drill bit from pulling out of the chuck while being raised up out of the work. A small wrench was supplied with the chuck for tightening the set screw onto the drill bits. On the outside, the Champion Never-Slip Chuck looks identical to a screw chuck - a small hollow barrel with two holes bored in one side, and a set screw threaded into the lower hole. The Never-Slip Chuck is threaded onto the drill spindle, and the hole in the upper section of the screw chuck appears to be a spanner wrench hole - to allow the use of a spanner wrench to install the chuck on the drill spindle. The lower hole was threaded and countersunk to allow the set screw to fit completely inside the body of the chuck - thus presenting no protrusions that could cause injury to the workman while the drill was turning. 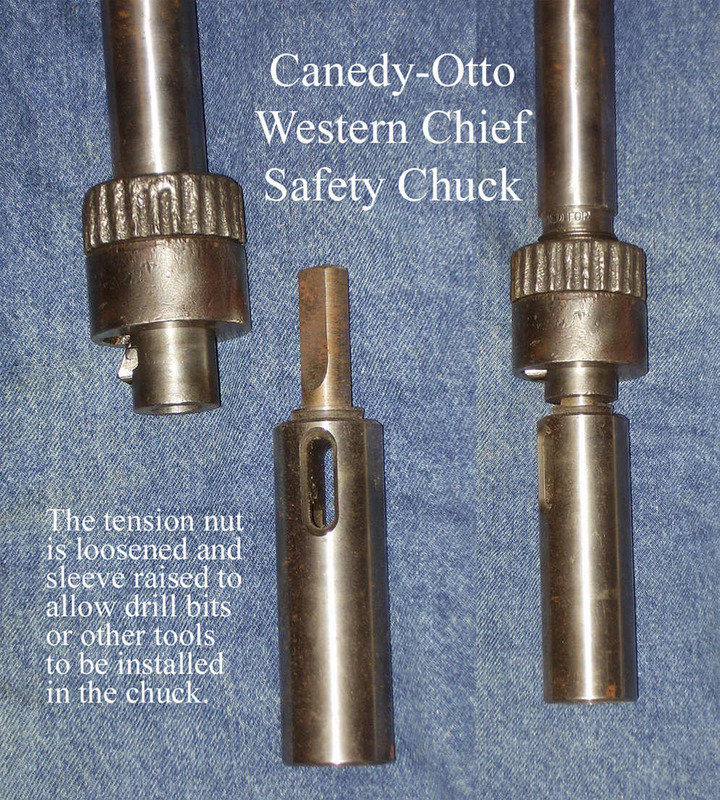 The Canedy-Otto 'Western Chief Safety Chuck' is a wedge and sleeve design. The flat surface of the wedge clamps tightly against the flat of the straight shank drill bit inside the Safety Chuck. The lower sleeve of the chuck has a tapered slot that presses against the inclined surface of the wedge - forcing the wedge inward against the drill bit as the threaded ferrule is tightened against the sleeve. Tightening the wedge against the flat of the drill bit provides the non-slip interlock that holds the drill bit tightly in the chuck. The Western Chief Safety Chuck needs no set screws or wrenches. The Safety Chuck socket and wedge slot were machined directly into the end of the drill spindle. Safety Chucks were also available as a separate product with a straight shank arbor to fit in the socket of another chuck, this being necessary when drill bit shanks were not of the same size as the chuck that was originally installed on the post drill. The wedge and sleeve design was vastly superior to the screw chuck in that, it provided a very strong non-slip grip on the straight shank drill bit, and the wedge and sleeve design did not cause any gouging or galling of the drill bit that was typically caused by a set screw. The Canedy-Otto was tightened by hand - gripping the knurled ferrule and twisting it to tighten the wedge against the drill bit until it is hand tight. 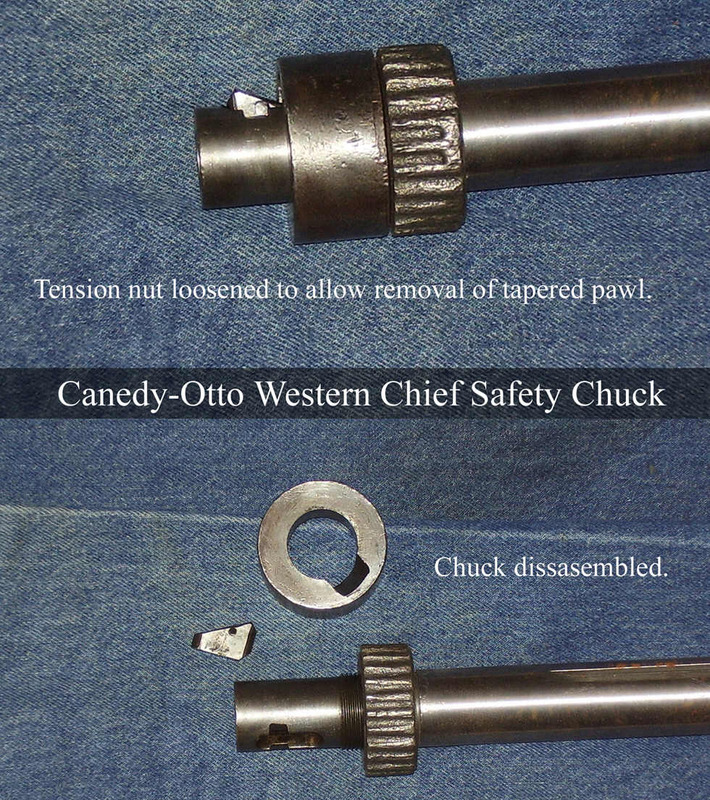 In the photos at right, a Canedy-Otto Western Chief Safety Chuck is shown with a taper shank extension that has been modified to fit in the 41/64-inch chuck. The taper shank extension in this photo is used as an adapter to accept taper shank drill bits without modifying the drill. The photo at middle right shows the Western Chief Safety Chuck disassembled, and the photo at far right shows a cut-away drawing of the inside of the Canedy-Otto Western Chief Safety Chuck. Useful and reliable relic from the past. Today the post drill has been almost entirely forgotten, an archaic antique of unknown purpose, treasured only by tool collectors and craftsmen who enjoy the atmosphere that these old tools give. However if electrical power is unavailable (whether by emergency or as part of routine construction work), these old drills continue to offer the ability to get small drilling jobs done, albeit with plenty more effort than a modern electric drill press. The post drill is an excellent choice for small wood working shops and small blacksmith shops that don't have access to electricity. Raising and lowering the drill. Rotating the feed wheel (and feed nut) causes the feed screw to move up or down, thus lifting or lowering the drill as desired by the mechanic. 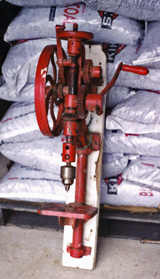 The feed wheel usually had a small wooden handle mounted on top for convenience of turning the feed wheel (see photos at right). 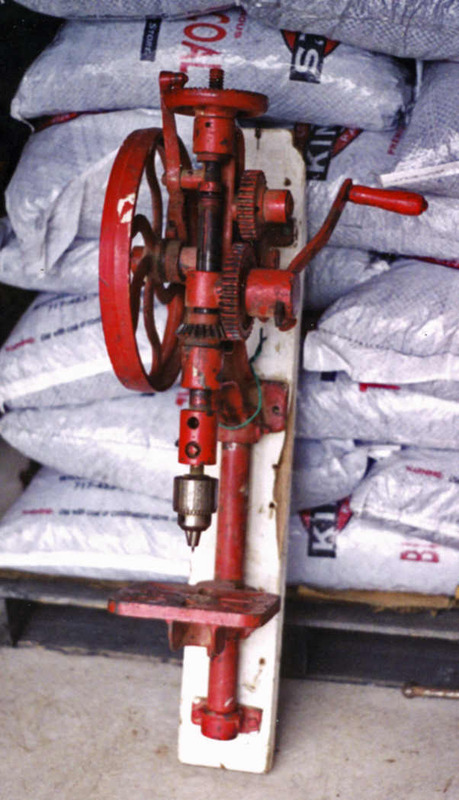 The wooden handle on the feed wheel was mounted on a small bolt, thus mechanics should be careful to avoid applying too much force to the wooden handle while turning the feed wheel by hand. The feed screw and feed wheel threads should be kept clean and oiled to allow easy operation of these parts. The wooden handles are often missing or broken or damaged on these drills. The wooden handle and bolt are very easily made and replaced. If the owner wants only to bring the drill back into 100% serviceability and is not concerned with authenticity or restoration, this author recommends making a replacement wooden handle by modifying a small chain saw file handle to fit. If it is necessary to make a new wooden feed wheel handle, it is important to keep the overall length of the handle very short to avoid applying excessive leverage that might bend the bolt that the handle is mounted on. If using a file handle to replace the original handle, it will be necessary to trim the length of the handle so that it is not excessively long. Self-feed operation. Self-feed means that the drill will automatically lower the bit into the work as the mechanic cranks the drill. Late model post drills almost always have a self feeding mechanism built into the drill. The self feed mechanism is necessary because both of the mechanics hands are busy holding the work and turning the drill crank. An automatic third hand was needed. 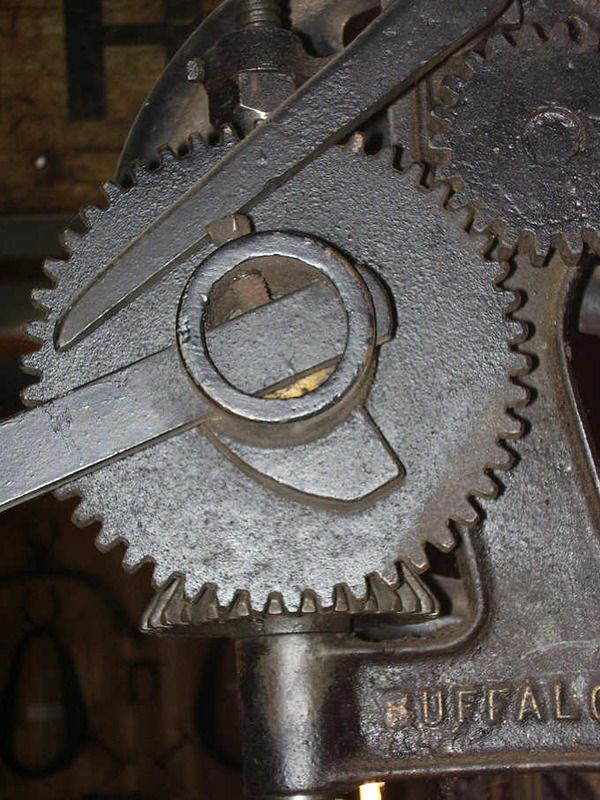 The self-feed is engaged by flipping the feed dog (at top of the feed arm) onto the ratchet teeth at top of the feed wheel. With the feed dog engaged, the self-feed will automatically lower the spindle and drill bit into the work as the drill is turning. 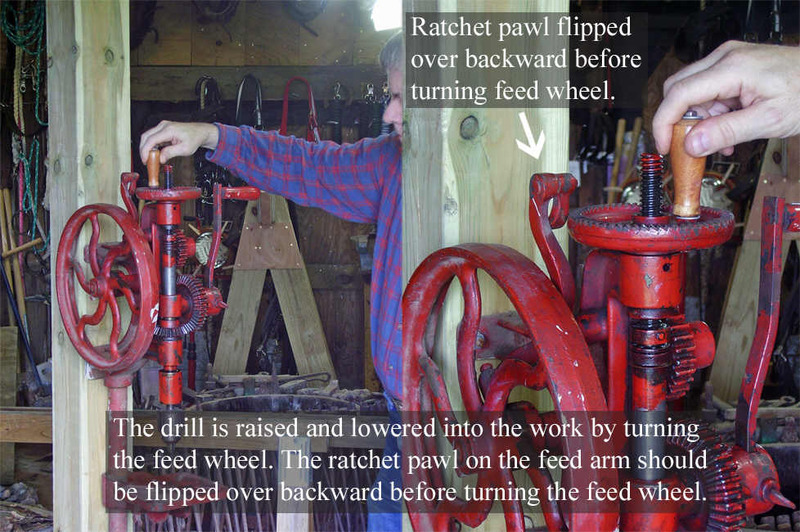 To raise the spindle, the feed dog is flipped backward off the ratchet teeth of the feed wheel, and the feed wheel is turned in reverse direction thus lifting the drill out of the work. Feed screw. A feed screw connects to the top of the drill spindle through a ball bearing. The ball bearings provide a low friction joint between the feed screw and the drill spindle. The feed screw is threaded through the feed nut inside the upper end of the drill frame. The feed wheel (at top of the drill) is fastened to the upper end of the feed nut with a set screw. The bearing race is fastened to the lower end of the feed screw with a long pin or rivet. The long end of the pin extends through the back of the bearing race and engages in the vertical slot that is machined into the drill frame, thus allowing free vertical travel of the feed screw while at the same time, preventing the feed screw from rotating. Feed arm. The feed arm is bolted loosely to the side of the drill frame. The bolt is located approximately in the middle of the feed arm, the bolt acting as a pivot that allows the feed arm to teeter or walk back and forth. 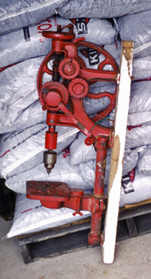 A dog (pawl) is riveted loosely to the top of the feed arm. The dog can be flipped "on" or "off" of the feed wheel - engaging or disengaging the self feed mechanism as desired by the user. When the self-feed dog is engaged on the feed wheel, the dog catches against the ratchet teeth and causes the feed wheel to turn in the down-feed direction. While traveling the opposite direction, the dog floats over the tops of the ratchet teeth. Most small post drills had only very limited adjustment of the self-feed speed - allowing the feed dog to advance the feed wheel by either one or two teeth at a time. Lower end of the feed arm rides on the surface of an eccentric wheel. The eccentric wheel is located on hub of either the flywheel or the drive gear, depending on the manufacturer or model of drill. The eccentric wheel provides the necessary motion that causes the feed arm to walk back and forth. The feed arm is held against the eccentric wheel by either spring pressure or gravity. 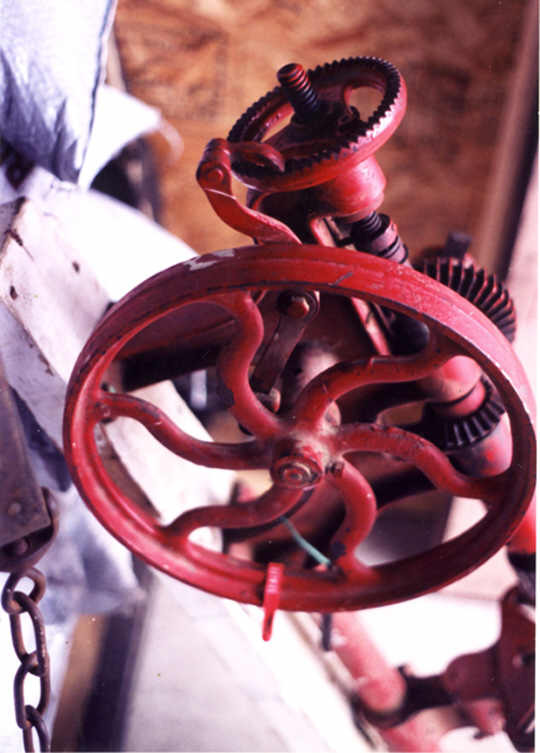 The feed arm on the red drill shown here has a hooked or bent shape so that the weight of the lower half of the arm holds it against the eccentric wheel on the flywheel hub by force of gravity. In addition, a small adjustable weight is fastened to the lower end of the feed arm to provide limited adjustment of the self-feed, and to provide more weight to hold the feed arm against the eccentric wheel. Extra features found on larger post drills. Quick change gears for multiple drilling speeds. Greater range of self-feed speeds. Fixed and free pulleys for use with line shafts. Quick return gears built into the self-feed mechanism for changing direction of self-feed so that the drill will return itself to the raised position quickly. Combination of lever feed and self-feed with the option to disconnect the self-feed - thus allowing the user to quickly lift and lower the drill using the feed lever. To see a high quality heavy duty post drill with lots of features (currently waiting for restoration), go here: Canedy-Otto New No. 16 Drill. Other features included removable drilling tables that allow a special rack to be used for drilling tires, and jack shafts to allow changing drilling speeds when lineshaft power is in use. 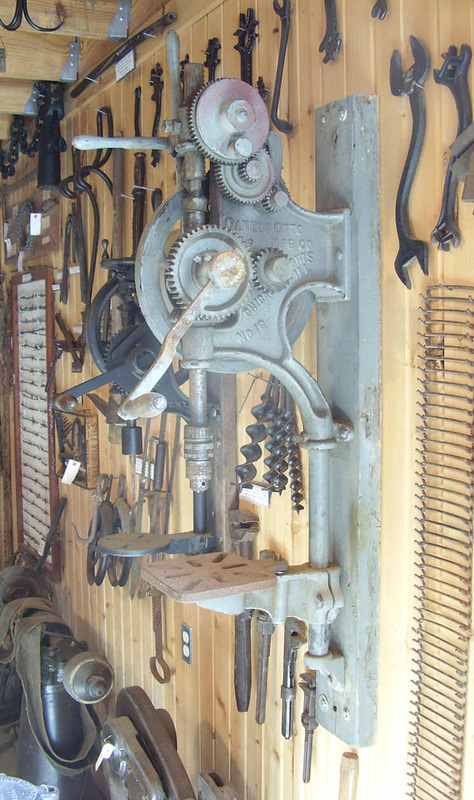 The two drills seen in the photo at right, belong to the author. The red drill on the left side of the photo is the two-speed red drill featured at the top of this page. 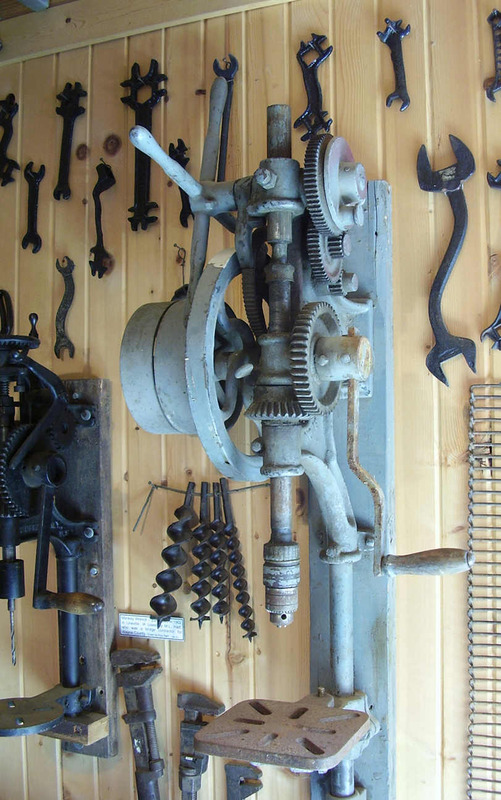 The black drill is a typical single speed drill that is most commonly found at flea markets. Take a close look at these two drills side by side. A third gear can be seen on the red drill. This third gear is a 'back' gear that allows a second slower speed that allows for increased torque in heavy drilling while drilling larger holes. Extra gears and removable crank hubs indicate that the drill has multiple speeds. Two-speed quick change gears. On post drills that are so equipped, speed changes often could be effected with; the flip of a lever, unpinning of a spring-loaded pin, or removing the crank lever and re-installing the crank on another gear. 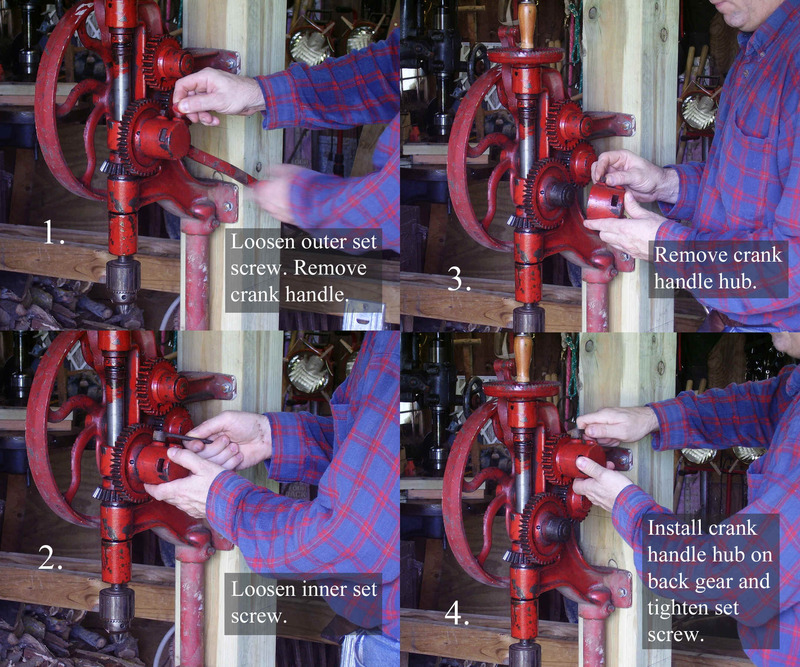 At right are photos of the author making a speed change to the drill by removing and re-installing the crank handle on a 'back' gear. In the first photo (near right) the crank handle and hub are mounted on the large drill spindle drive gear. This is the most used drive speed for smaller holes. 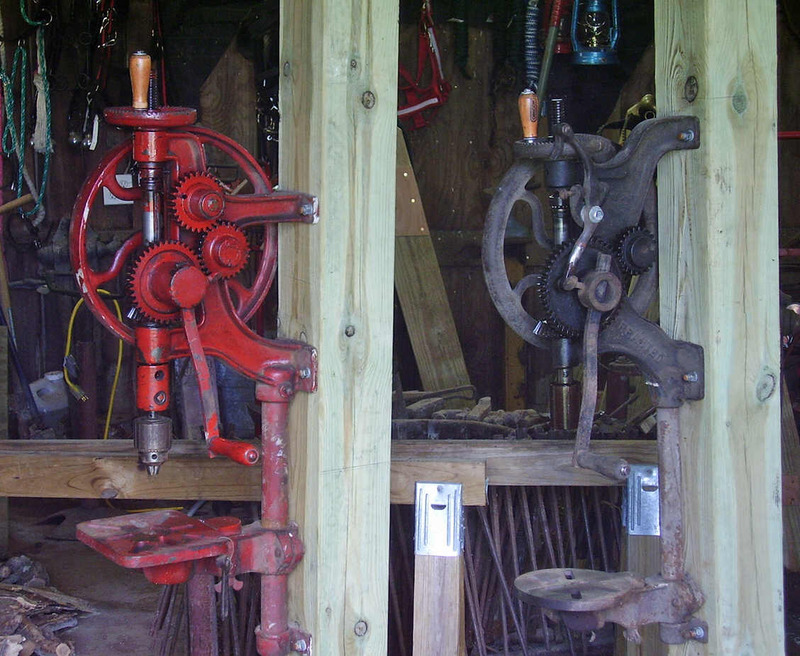 The photo shows a close comparison of a two-speed drill with back gear, and a single speed drill. The next photo (middle right) is a composite showing the steps in changing speeds on this drill. The final photo (far right) shows the crank handle and hub mounted on the back gear - and the drill is ready for drilling larger holes. Mounting/installing a post drill. This is the most important aspect of setting up and working with post drills - mounting/installing the drill at the most effective and convenient working height. It is best to mount the post drill to a post. 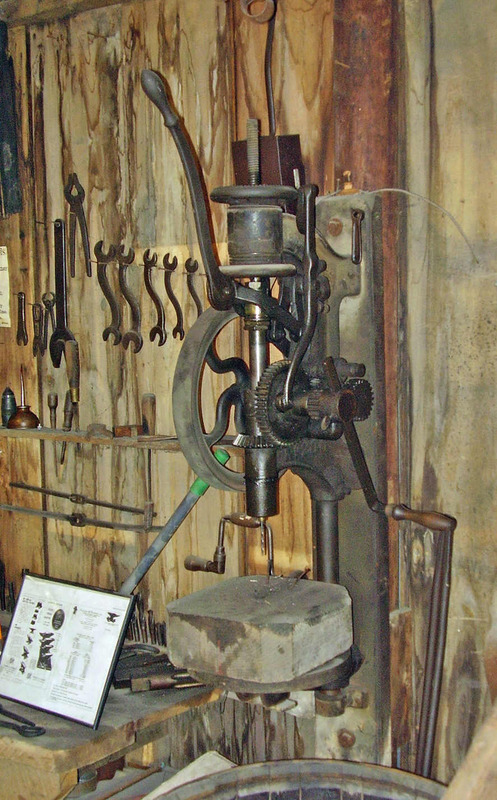 Mounting the post drill to a wall presents problems including being an inconvenient location for working, and preventing operation by hand because the hand crank runs too close to the wall and causes injury to the mechanic's hand. The ideal location for a post drill is to mount it to a post or column near the middle (or middle side) of the workshop. Ideal mounting height or working height for post drills. The photos (at right) show a post drill mounted at the easiest and most effective working height. A hand operated post drill requires a great amount of repetitive and forceful motion to turn the drill in the work. This force is continuous as long as the drill bit is cutting. This means that the mechanic must exert force to turn the crank handle throughout every angle of the handle rotation. While operating the post drill, there are only two comfortable motions for exerting force - pushing horizontally, and pulling upwards at a 45 degree angle. It is not comfortable to lift with the arm extended, nor is it comfortable to push downward or upward above the level of the mechanic's shoulder. Correct drill mounting height takes these physical limitations into consideration. When planning installation height of a post drill, measure to the center of the mechanic's shoulder joint to obtain the proper height of the crank handle, at its highest point of rotation. Measuring for best drill height. With the crank handle installed in the drill at its longest length, rotate the crank handle until it points straight up. Hold the drill in position against the post where it will be mounted, and raise/lower the drill until the crank handle is level with the center of the mechanic's shoulder. Mark positions of the drill mounting holes on the post. Now drill the post and install the drill. The most ideal working positions of the post drill can be seen in the photos at right. Why did old advertisements and catalogs depict their post drills mounted at eye level (too high)? Many old tool catalogs (including my 1909 Champion Blower & Forge Co. Catalog) have drawings that depict their post drills mounted at, or above eye level. The reason for this is actually quite simple, and it has nothing to do with how these drills were intended to be used. A raised viewing angle perspective creates an impressive/superior viewing aspect which causes the viewer to look up to the item being advertised. Like a great statue of a local hero on horseback � placed on a raised platform high above the public viewing area � it garners respect for the object being viewed. This same effect is used in advertising to cause the intended viewers to look up to the product being advertised � even if only printed in a catalog or newspaper. Most people today mistakenly believe that this is the actual height at which their own drills must somehow be mounted. It doesn�t take a rocket scientist to soon discover that mounting a hand-operated drill so high above the floor actually makes the drill very difficult to use. In reality, a hand-operated post drill is better installed/mounted at a lower height that offers the mechanic more convenient and comfortable access. The tallest height that is comfortable for a man to work with his hands, is no higher than shoulder level. Therefore a post drill should be mounted at a much lower height than suggested by the drawings or engravings of post drills found in old advertisements or catalogs. Many post drills have spent literally years sitting around in a pile of junk, collecting dirt and dust. Grease and oil having long since dried up and hardened, after sitting for so long unused. Dried grease and oil and dirt will make the post drill very difficult to operate. The bearings and journals and gears must be thoroughly cleaned and lubricated to bring the drill back into service. WD-40 or kerosene or other solvents may be used to soften and dissolve dried grease and oil. Oil holes should be cleaned out thoroughly to allow oil to be added to bearings and other moving parts. All bearings and moving parts should be oiled before turning or operating any moving parts of the drill - even before cleaning is complete. No parts should be forced to turn unless lubricated first. Some parts might not be accessible due to being permanently riveted together. The best way to clean permanently joined parts is to flood the oil holes with oil and thus encouraging the oil to dissolve and wash away dried deposits. This is especially true of the bearing journals for the flywheel shaft and crank handle drive gears. Gear teeth must be thoroughly cleaned of all deposits of dried grease and oil and dirt - no matter how small these deposits might appear to be - because even the smallest deposits of dried grease and oil will make the drill difficult to turn. After thoroughly cleaning all moving parts, the drill should be well oiled with good quality oil. What a difference cleaning and oiling makes. At right is a photo of the gears on the author's Champion Blower & Forge Company Number 98 drill. 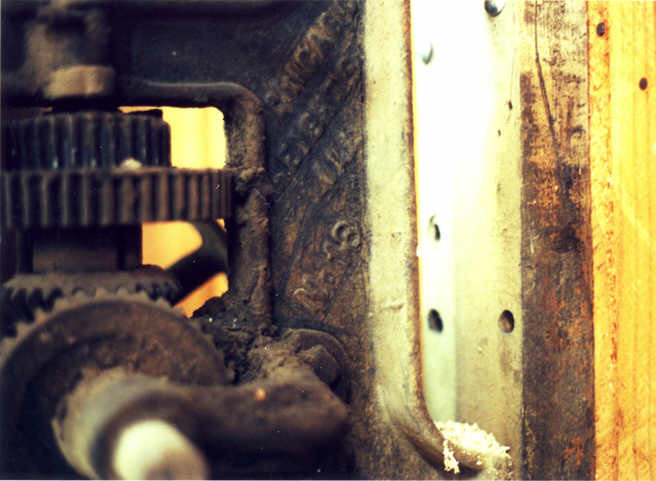 Look closely at the tiny deposits of dried grease and oil that have formed inside the gear teeth. These deposits made it very difficult for the author to turn the crank handle to operate this drill by hand. After cleaning and oiling, this drill turned so easily that it is now normal to be able to start the drill turning, let go of the crank, and the drill continues to turn on its own for several seconds. The hand cranked drill requires a large amount of effort just to drill each hole. Any friction due to dirty bearings or gears will make large drilling tasks almost unbearable. A well maintained post drill will continue turning for several seconds after letting go of the crank handle, and will make the task of drilling much easier. Where to buy a post drill. 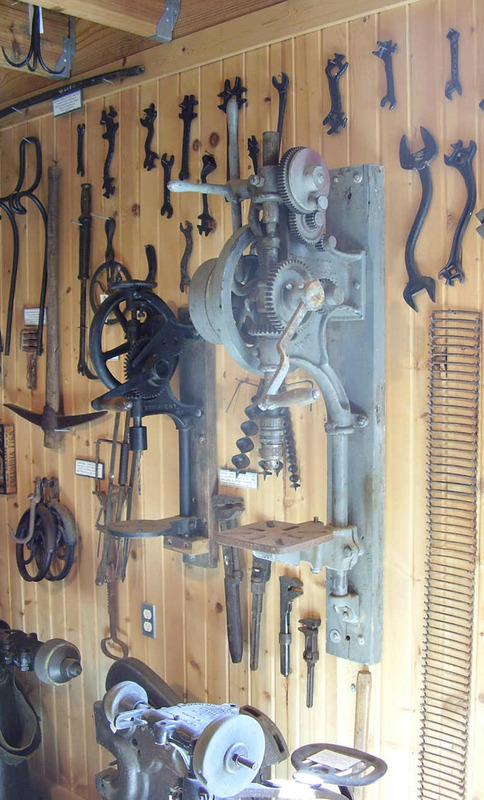 Post drills can be found at draft horse auctions, steam power and antique engine shows and related flea markets and swap meets, and at some farm auctions and estate auctions where the owner used older tools. What to look for - what to avoid. Look for drills that are complete - all parts present and in good working condition. Beware! Many of these old drills have been damaged and dismembered by recent owners and some drills might be in crippled or unserviceable condition. Parts might be worn out or missing entirely. Look for bearing journals (any joint that a moving part passes through) that are not worn out or loose. Replacing worn out bearing babbitt is a job for experts only. Look for gear teeth that are NOT worn out, badly pitted, or broken. Operate the drill and to determine condition of parts - look for smooth movement of parts. Avoid any drill if movement feels like parts are grinding or rough. Set screw threads in the drill chuck should be in good condition - NOT stuck or stripped or loose. DON'T BUY a drill if any of the following conditions are present: feed wheel missing or broken, feed arm missing or broken, drill spindle bent or missing or broken, flywheel missing or broken, lower frame or table missing or broken, gears missing or broken or teeth broken or excessively corroded or pitted, broken or worn out bearing connection between feed screw and spindle or bearing balls missing at this joint, or any other parts missing or broken. Repairing these old drills is a job for expert machinists and mechanics - NOT beginners! If a person must ask, they are not experts. 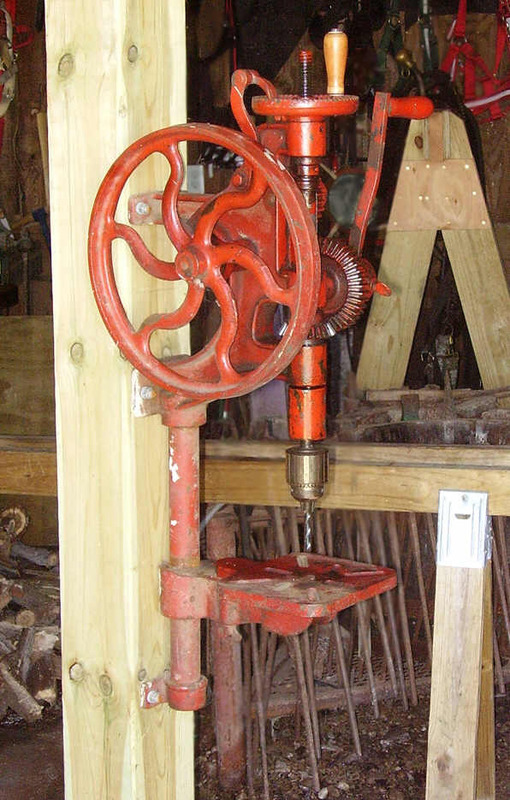 Converting the antique post drill for modern drill bits. Post drills were made during an era when common size straight shank drill bits were widely available. These old 'blacksmith' drill bits are no longer manufactured. Placing a modern drill chuck in the original antique chuck allows the post drill to accept modern drill bits without requiring any permanent changes to the drill or chuck. The only part that requires modification is the arbor of the new drill chuck. 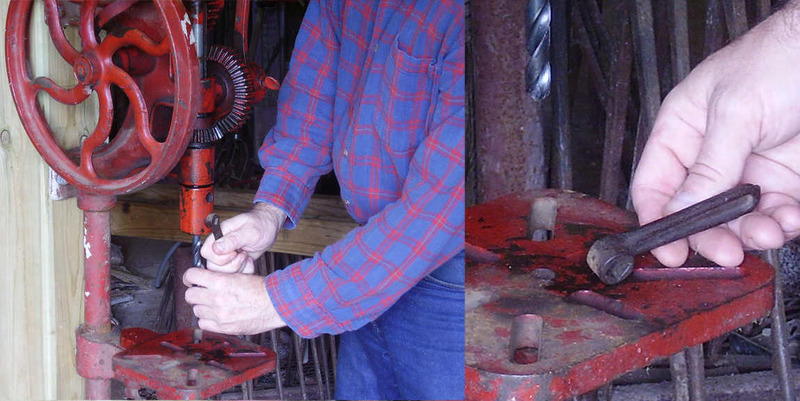 An example of this is the Jacobs #3B 1/2-inch drill chuck installed on the red post drill in the photos (at right). The round shank of a new chuck arbor should be trimmed to length and machined with a flat similar to the shank of a straight shank drill bit. The flat should be milled onto the shank - not ground. Heat from grinding could warp the shank and cause the drill to wobble or 'run-out' excessively during use. Arbor shank length should be short as possible to reduce run-out or wobble. Mounting a modern drill chuck in the post drill will not prevent wobble or runout because the drill chuck arbor is fitted into the original chuck as though it were a straight shank drill bit. Post drills require good quality drill chucks. Post drills are very tough drilling machines and they place a large amount of stress and torque on drill bits and chucks. The original straight shank bits had a flat groove machined on the side of the shank that allowed a positive (non-slip) grip on the drill bit, and this flat groove allowed the drill to turn forcefully in the work. A typical modern drill bit does not have a machined groove on the side of the shank, and consequently a modern drill chuck must rely on friction to hold the bit during heavy drilling. Therefore it is important to choose a drill chuck that can hold a drill bit very tightly. It is best to use Jacobs brand or equivalent heavy duty drill chucks. Cheap imported chucks often 'pop' open during heavy drilling. Where can I buy new chuck arbors? This author recommends MSC Industrial and Enco and McMaster-Carr. MSC Industrial Supply website: http://www1.mscdirect.com/ Enco website: http://www.use-enco.com/ McMaster-Carr website: http://www.mcmaster.com/ These links also appear on my Links page under the heading Machine Shop Tooling & Supplies. There are only two sizes of straight shank arbors available today, 1/2-inch round and 5/8-inch round. The 41/64-inch size is no longer made. Straight shank chuck arbors can be ordered in all sizes of Jacobs taper and threaded ends for use with modern drill chucks. New arbors will require machining (as described in the previous paragraph 'Converting the antique post drill for modern drill bits'). New arbors can be purchased for around $15-19 (prices around 2008-2009) and machined to fit the post drill for about $40. 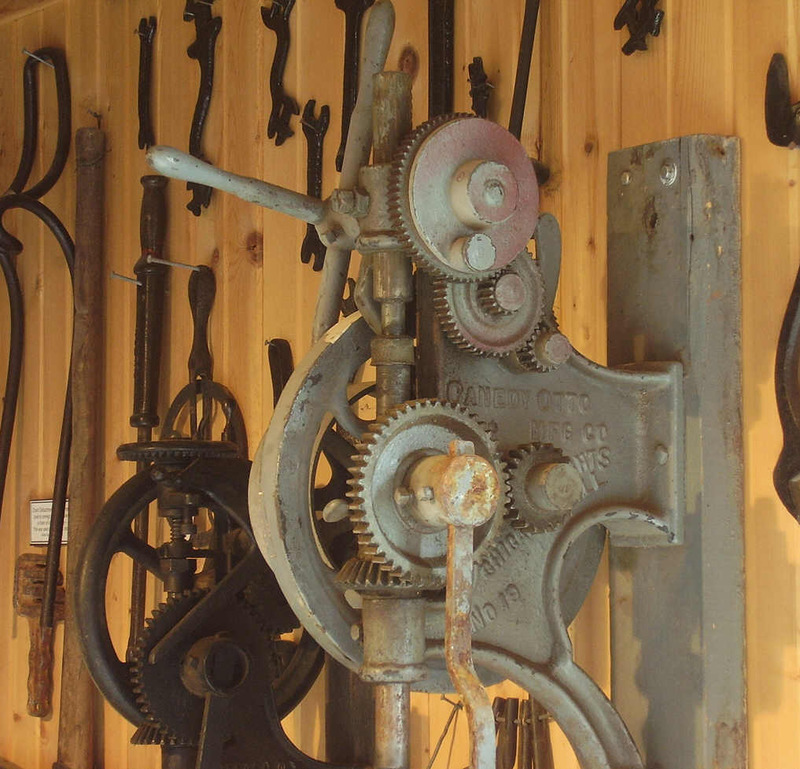 Additional resources to learn about chucks, arbors, and tooling for drills. See the author's description of taper shank tooling here: Morse Taper . The Jacobs Chuck Company website offers the manufacturers recommended procedures for removing and installing chucks and arbors. The author's Jacobs Chuck page shows a Jacobs chuck disassembled, reassembled, and installation of taper shank arbors. ATTENTION! - Hobbyists: get help! It is not possible to teach you over the internet. Find a local machinery supplier that can assess your tool requirements for you. Beginners must learn to distinguish between the different sizes of shank ends and arbor ends. The shank is the part that is inserted into the socket of a drill press spindle or in the bit end of a drill chuck. The arbor end is the short tapered or threaded end that fits into the mounting hole of the drill chuck. Learn to use rules, tape measures, and calipers, or find someone to measure your tools and machines for you. There is very little documentation on these old drills. The information that appears on this webpage is mostly from my own observation. What you see here is everything I have. With exception of a couple of antique catalogues and old magazines, there is no other information available. The purpose of this page is to introduce the new user to these old drills. Setting up and using a post drill requires common sense. 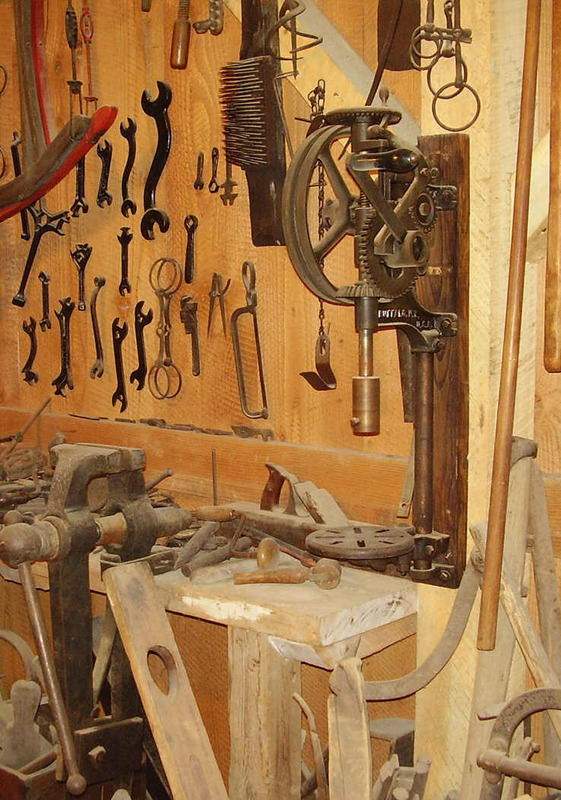 In the bygone era when these tools were made, people were much more intelligent then they are today. They understood how to set up and use the tools that they made or bought. They didn't need a 27 page booklet explaining to them for example, how to use a hammer or a wrench. If the modern buyer can't figure out on their own how to use these drills, then they have no business getting one. Tools are useless and dangerous in the hands of a dummy who lacks common sense. There are no instructions for these old tools. When you buy an antique, you are on your own as far as learning how to take care of it and using it. If you need more information on your drill, you are out of luck as it most likely doesn't exist. Canedy-Otto No. 19 Post Drill. (Photos at left) The Canedy-Otto Number 19 is a medium size post drill that can be powered by lineshaft or by hand cranking. This is one of Canedy-Otto's professional lineup of drills, and were intended for professional blacksmiths, mechanic shops, and light manufacturing. These drills featured a four-handle feed lever for fast raising and lowering of the drill when lineshaft power was in use. 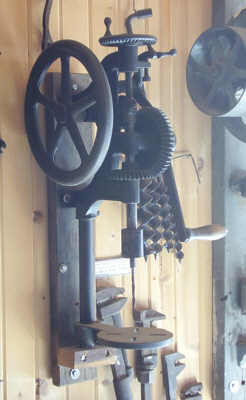 The Number 19 was intended for use with lineshaft power, but also featured a hand crank for operating the drill when lineshaft power was stopped. This section has serious flaws and will be re-written. The auto-feed mechanism does not include any means for quickly raising or lowering the drill spindle - no feed wheel such as one would see mounted horizontally on top of the red post drill at top of this page. The only way to lift the drill feed was by engaging the four-handled feed lever and using this lever to lift the drill out of the work. The Canedy-Otto Number 19 will drill to the center of a 17-inch circle and has a total up and down movement of 5-1/2-inches. Largest distance from table to drill chuck is 14 inches. Will drill hole sizes up to 1-1/4 inches. The chuck used on the Number 19 is a Western Chief Safety Chuck. The Western Chief Safety Chuck is a high quality hand tightened chuck that offers a very strong and reliable grip on drill bits. The Western Chief Safety Chuck is described in detail in the above Red Drill section titled 'Drill chucks for post drills.' The No. 19 was available with chuck sizes for 1/2-inch or 41/64-inch. The drill shown here appears to have a 1/2" socket drill chuck. Size of pulleys is 8" x 2". Manufacturer recommends these should run at 190-200 revolutions per minute. Weight is approximately 140 pounds. A modern style keyed drill chuck and arbor have been modified to fit in the original Western Chief Safety Chuck to allow the use of modern style drill bits. For safety, the hand powered crank handle and hub were removed when lineshaft power was in use. This was very important because the rotating crank handle could cause injury if it is allowed to spin around while lineshaft power was in use. The crank handle and hub are quickly and easily removed by loosening the set screw closest to the large beveled spindle drive gear, and sliding the loosened hub off of the gear. Hand powered. Two speeds were available during hand powered operation - a high speed for smaller bits, and a low speed with higher torque that was easier for the operator to crank during heavier drilling with larger bits. The mechanic selected the desired gear speed by installing the hand crank hub on either the larger drill spindle drive gear extension, or on the smaller flywheel gear extension. The larger front spindle drive gear offered faster drilling. 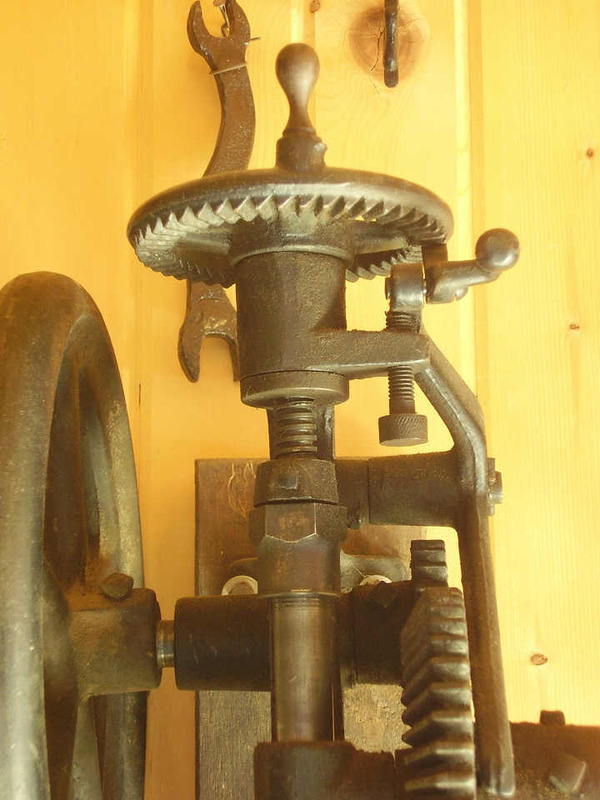 The smaller gear on the flywheel shaft had approximately half as many gear teeth and, would drive the drill half as many revolutions per turn of the hand crank - offering nearly twice the drill torque for drilling larger holes. 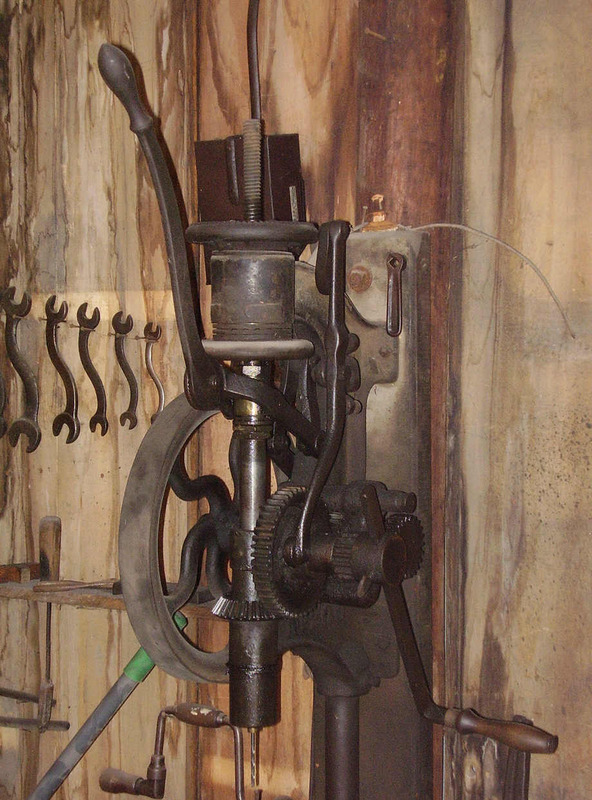 The drill (photo at right) is shown with the hand crank installed on the larger drive gear. It is difficult to see in the photos here, the entire hub with crank handle could be removed after loosening a set screw. Look closely at the location where the crank handle attaches to the drill. There are two set screws on the hub. One set screw tightens the handle in the hub and allows the length of the crank handle to be adjusted. The second set screw, located closer to the spindle drive gear, tightens the crank hub to the journal extension on the side of the gear. The crank hub was removed/re-installed by loosening and tightening the set screw that nearest to the gear. 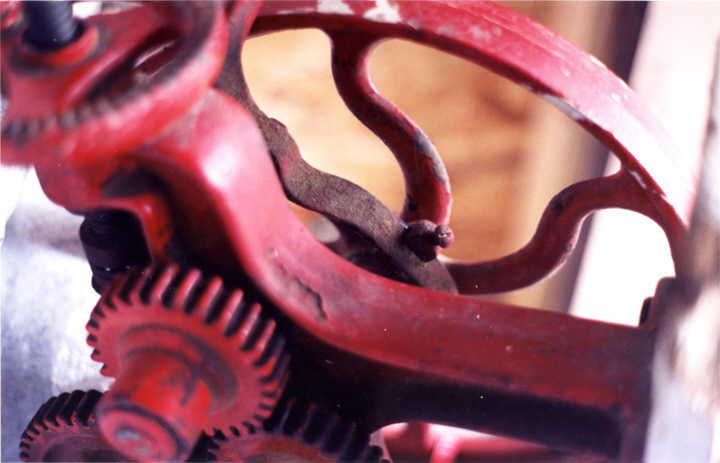 This identical crank handle and hub can be seen in the Red Drill section at top of this page in the paragraph titled 'Two-speed quick change gears.' 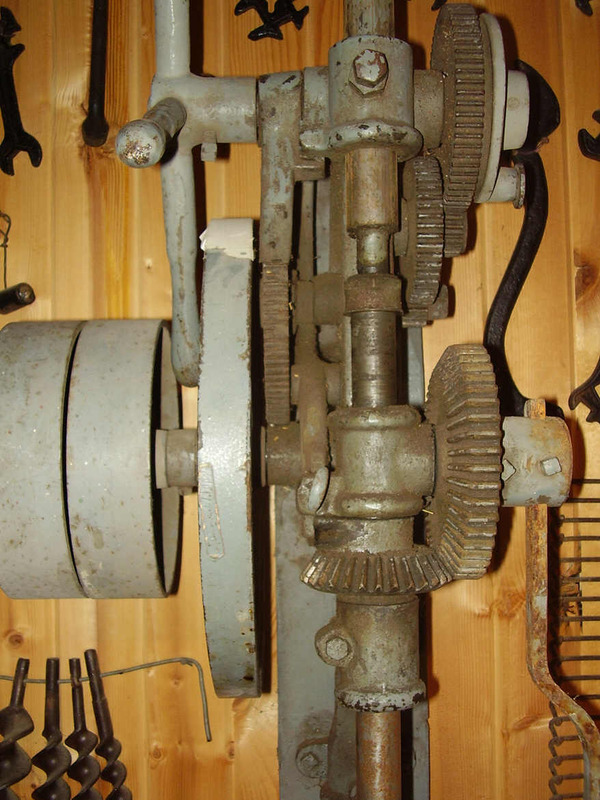 See the paragraph titled "Two-speed quick change gears" in the Red Drill section above to learn more about changing speeds by removing and re-installing a crank handle and using back gears. Feed rack and pinion feed shaft. This drill was built for lineshaft use. 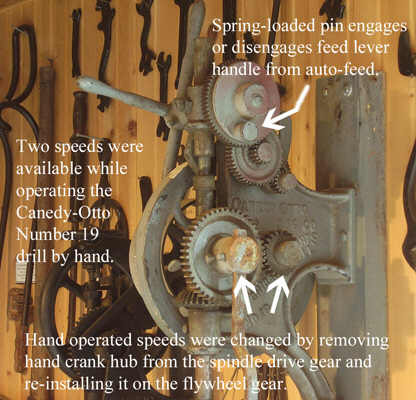 Instead of a horizontal feed wheel and threaded feed pressure screw that is used on smaller drills, the Canedy-Otto Number 19 used a rack and pinion style feed pressure shaft to force the drill into the work. Look closely at the rear surface of the spindle shaft at the top of drill - there are gear teeth visible that are cut into the rear side of the shaft - thus this shaft is described as a 'rack'. The teeth in the rear of the rack mesh with teeth that were cut on the feed pinion shaft - inside the upper journal of the drill frame. There are three feed gears visible at the top of the drill, one large, one medium size, and one very small. Let's start with the small gear. 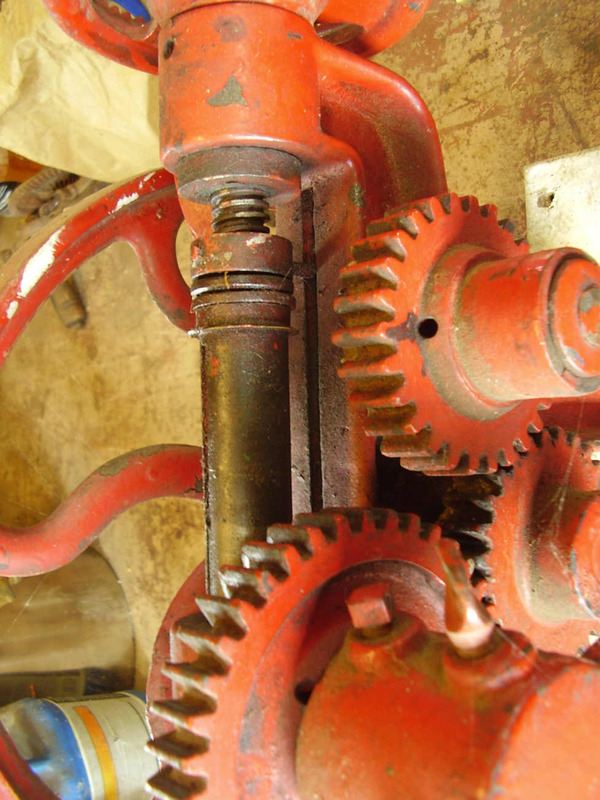 The small feed drive gear is installed on the auto-feed shaft - the auto-feed drive wheel is mounted on this same shaft on the right side of the drill. The small gear was designed to reduce the amount or distance of rotation input from the auto-feed wheel. We'll talk more on this later. The next gear is the medium sized idler in the middle of the three auto-feed gears. There are two sets of gear teeth cut on this gear - this again is designed to reduce the amount or distance of rotation input from the auto-feed wheel and gear. And the last gear described here is the large feed gear. The large feed gear is mounted on a rack pinion shaft that runs through the upper frame of the drill - running through the top of the drill frame behind the vertical feed rack. Gear pinion teeth are cut on the rack pinion shaft - the gear teeth mesh with the rack teeth cut in the rear surface of the vertical feed pressure shaft or 'rack'. The large feed gear and pinion shaft drive the feed rack up and down. The three auto-feed gears - reduce the input movement of the auto-feed wheel - and drive the feed rack and drill spindle into the work in very small incremental amounts with every inpulse movement of the feed wheel. 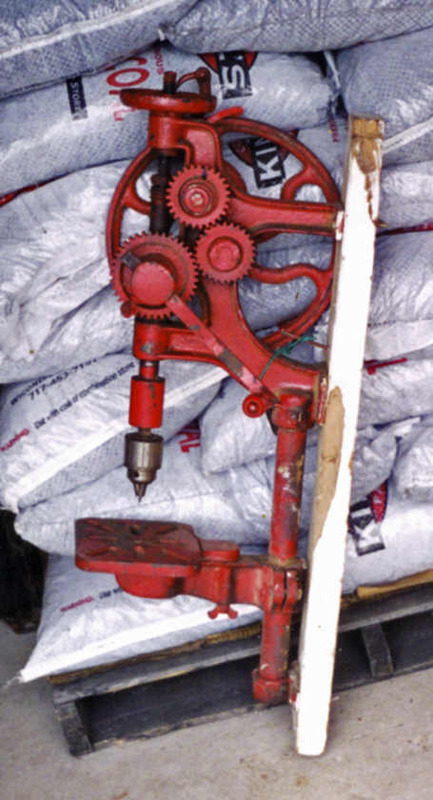 A spring-loaded ratchet dog holds the feed wheel in place while the auto-feed is returning back to its starting position. This ratchet dog is easy to see in two of the photos (at near left). The ratchet dog is a short simple lever that is mounted above the front of the feed wheel. The upper end of the dog is mounted on the middle of the rack pinion shaft between the 4-handle lever and the drill frame. The lower end of the dog is sharpened to a blunt flat edge that catches in the teeth in the feed wheel. A little 'ear' is cast into the middle of the ratchet arm. The ear extends under part of the drill frame where a small spring can push against the ratchet dog. 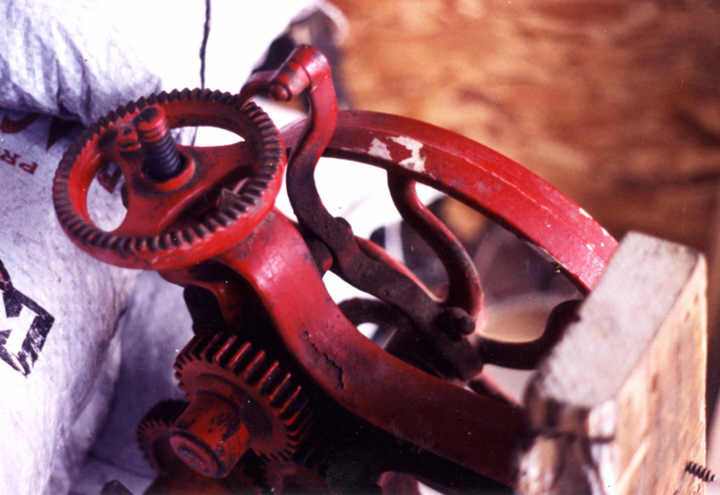 The spring applies pressure to the ratchet dog to keep it continuously engaged in the feed wheel teeth - to prevent the feed wheel from backing off pressure on the spindle while the auto-feed rocker arm is moving in the opposite direction. Using the 4-handled feed lever. 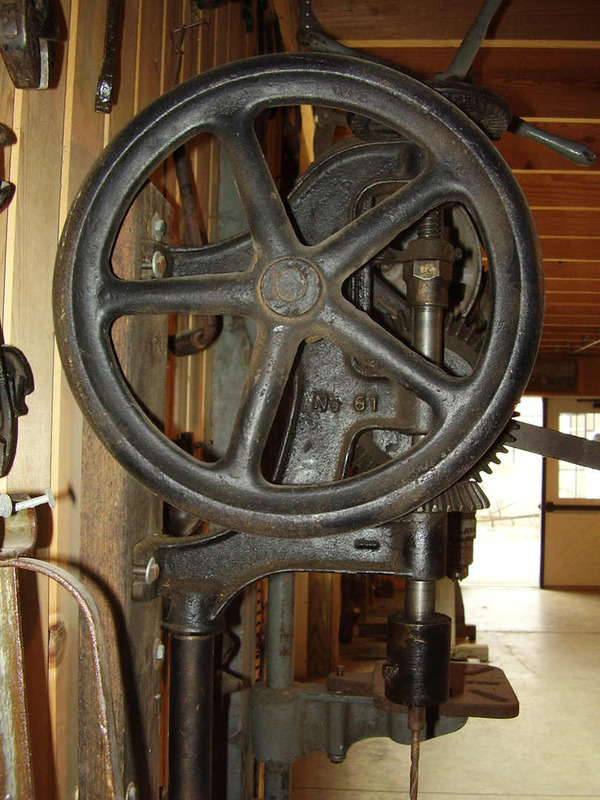 This large lever is used exactly like the large multi-handled levers on modern drill presses. The feed lever will not move the drill feed until it is disengaged. The auto-feed is disengaged by pulling out, and rotating a spring-loaded pin that is located in the large auto-feed gear. See the large photo (above right). 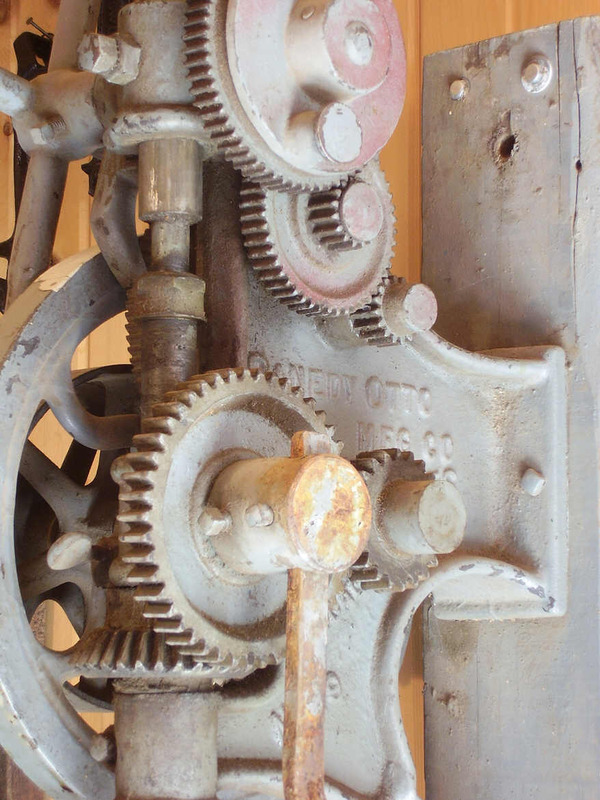 The knob mounted on the large auto-feed gear contains a spring-loaded pin. To disengage the pin, the knob is grasped and pulled out and rotated. A small stud inside the knob prevents the pin from re-seating after it is pulled out and rotated. This disengages the auto-feed mechanism. The 4-handled feed lever can now be used to quickly raise and lower the drill spindle. To re-engage the auto-feed, the knob on the auto-feed gear is simply rotated until the small stud inside the knob realigns with the corresponding relief hole in the gear plate, and the knob snaps back into place under spring tension. It may be necessary to grasp the 4-handled feed lever and rotate it until the knob and pin realign with the hole in the auto-feed gear. The spring loaded pin immediately snaps back into the hole when the pin and hole are re-aligned. With the auto-feed know pulled out to the open position, the entire auto-feed gear train was bypassed. With the auto-feed gear train bypassed, the large auto-feed gear is disconnected from the rack pinion shaft that it is mounted on - the shaft will spin freely inside the gear thus allowing free movement of the rack pinion shaft. The 4-handle feed lever is fixed to the opposite end of the rack pinion shaft, and the 4-handle can now be used to rotate the pinion shaft and thus run the drill spindle up or down. Free and fixed pulleys were mounted on the flywheel shaft - next to the flywheel on the left side of the machine. The outer pulley on this drill (fixed pulley) was fixed to the flywheel shaft by tightening the set screw located in the center of the pulley. The inner (free pulley) pulley was left loose so that it could rotate freely without causing the flywheel shaft to turn. A shift lever would be used with this drill to allow it to be powered by a flat belt and lineshaft. 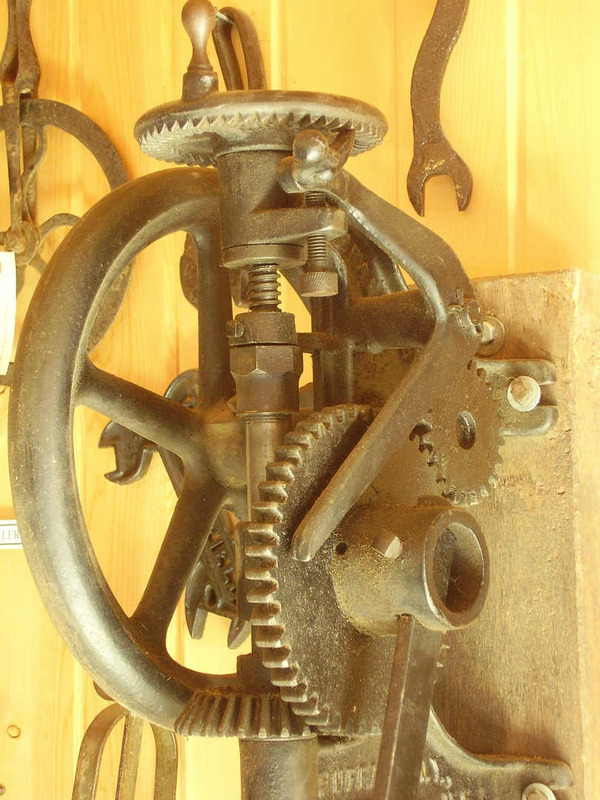 The lever would have been a wrought iron bar with forks forged on one end to fit around the lineshaft belt, and would have been used to move the rotating belt off of one pulley and onto the other pulley. During idle periods when lineshaft belt was running, the belt would have been shifted onto the free pulley - the free pulley spinning with the lineshaft belt but not turning the drill. 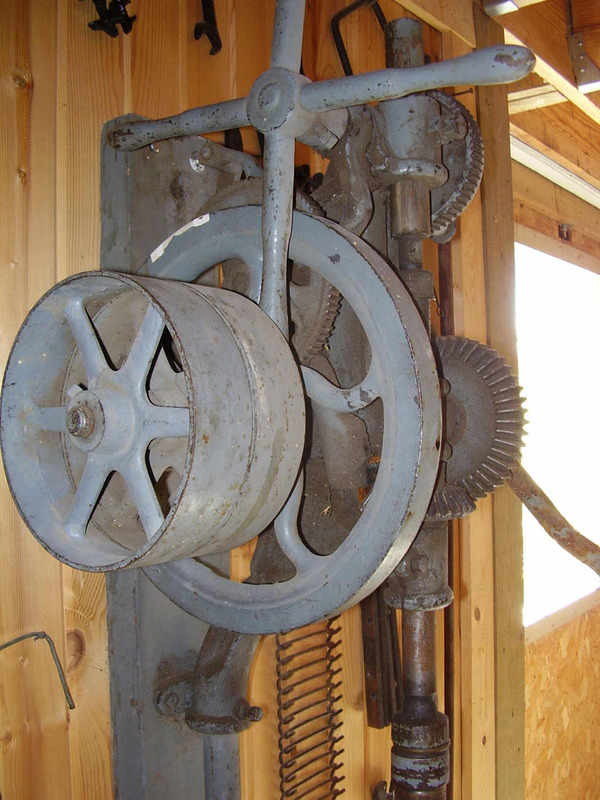 When it was desired to operate the drill, the mechanic would pull the belt shifting lever, moving the belt onto the fixed pulley, and started the drill turning under lineshaft power. The catalog does not show a forked shifting lever for this drill, so the lever might have been supplied by the owner of the drill. Rachet dog and spring are both visible in photos (near right). In the two photos (near right) the ratchet dog that prevents reversal of the feed wheel, is visible in the upper middle area of the photos. The ratchet dog is hung on the middle of the rack pinion shaft between the 4-handle feed lever and drill frame. The ratchet dog is slightly curved so that its pointed end will fit into the teeth of the feed wheel. 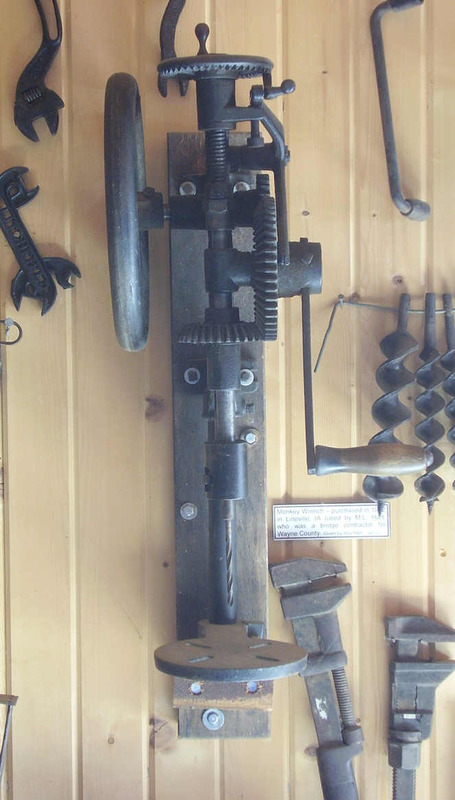 Look closely at the photos, the middle of the curved ratchet dog passes closely near the upper journal of the drill frame, and a tiny spring is inserted between the ratchet dog and the rear edge of the upper journal. The small spring pushes the dog into the ratchet teeth in the feed wheel. This spring must be present in order for the auto-feed to function. If the spring is lost, then the auto-feed will not be able to force the drill into the work. However the 4-handled feed lever will still function even if the auto-feed is no longer available. The spring is easily replaced with new spring available at any machinery supplier today. This drill is in great shape. A small modern keyed chuck was installed in the Western Chief Safety Chuck by the previous owner. The keyed chuck is mounted on a straight shank arbor and installed in the original Western Chief Safety Chuck as though it were just another straight shank drill bit. The keyed chuck allowed the use of modern jobber type drill bits in this drill. The Canedy-Otto Number 19 post drill was meant to be mounted to a post or column. The frame of this drill mounts too closely to the wall to allow effective use of the hand crank. Mounting to a post would allow clearance around the hand crank for best hand operation of the drill. Where to see this drill: Prairie Trails Museum of Wayne Country. Highway 2 East, P.O. Box 104, Corydon, Iowa, USA. 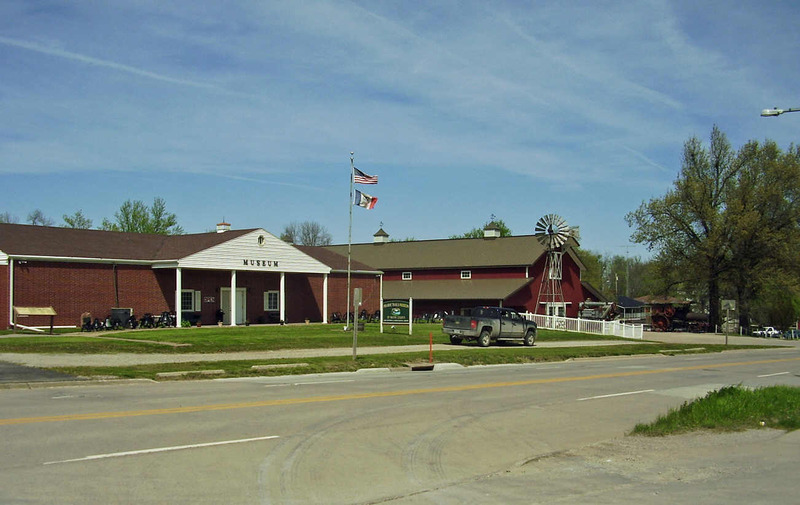 www.prairietrailsmuseum.org Located on highway 2. Look for the red barn with the steam traction engine in front. The main museum building contains displays of early American life during the late 1800s and early 1900s. 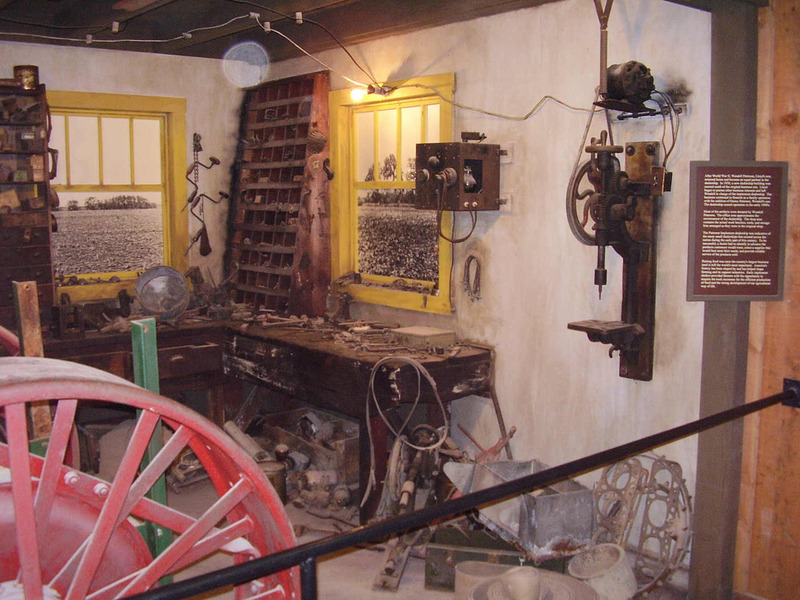 The barn is filled with wagons and farm implements and machinery from this same time period. Buffalo Forge Number 61 Post Drill. The Number 61 is a small inexpensive light-duty post drill that was made for small home workshops and small farm shops. The drill chuck was a simple screw chuck with a 1/2-inch socket for use with straight shank drill bits. The chuck featured a recessed pocket for the set screw so that the set screw would not protrude outward and thus present a safety hazard to the mechanic while operating the drill. This was a safety feature provided by the better quality drills. The Number 61 was an inexpensive drill with very simple features including; small brass feed wheel knob, single-speed, a short crank handle, and a simple cam and lever auto-feed mechanism. The Buffalo Forge Number 61 post drill is a 12-inch drill press - that is, the Number 61 will drill to the center of a 12-inch circle. The Number 61 has an up and down run of approximately 3 inches. Feed wheel knob made of brass. The feed wheel handle knob is made of brass and threaded into the feed ratchet wheel. The knob is small and attractive in appearance, but it does not rotate and thus it could be uncomfortable and difficult to use for multiple drilling tasks. Drill mounting. 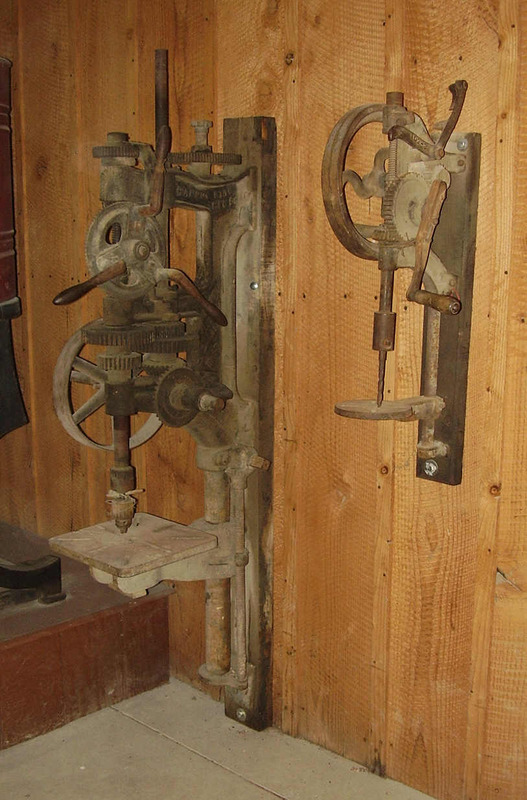 This drill was photographed in a museum where, it was mounted on a 2" x 5" plank, and the plank mounted on the wall. The plank is too thin for effective use of the drill because it places the drill too close to the wall and causes the flywheel to rub against the wall. The close placement also causes the mechanics hand to strike the wall while turning the hand crank. It would be best to mount this drill on a 6" x 6" post or column. 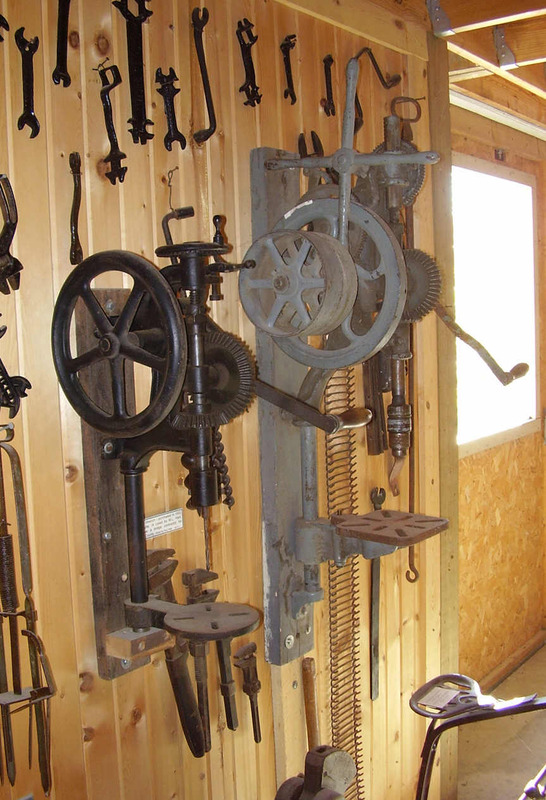 If necessary to mount the drill on the wall, it would be better to double the thickness of the plank to 3-1/2" to 4" thick, thus allowing the flywheel to turn freely and to allow more space to allow the crank handle to be used without coming in contact with the wall. 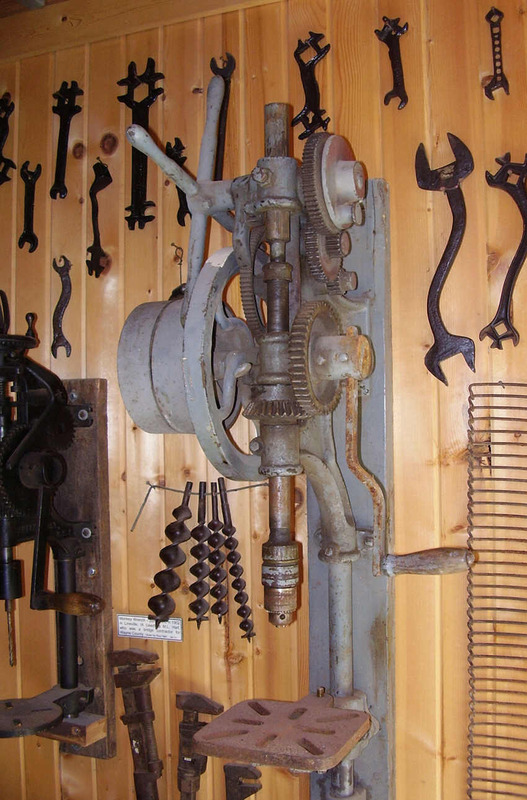 Ratcheting auto-feed mechanism. The thumbnail photos (at right) show the racheting auto-feed mechanism. The ratchet teeth of the feed wheel are faced downward on this drill. The cam is a simple eccentric lobe that has been cast and machined on the side of the spindle drive gear. The rocker arm operates by gravity - the heavy end riding against the eccentric cam lobe. The ratchet dog riveted to the upper end of the rocker arm is also gravity operated. A little ball on the end of the ratchet dog pulls down on the rachet dog, thus lifting the pointed end of the ratchet dog up into the ratchet teeth cut in the bottom of the feed wheel. The movement of the rocker arm can be adjusted to limit the amount of movement or distance that the drill spindle feeds into the work with each rotation of the drill. In the two photos (near right) a small ear is molded onto the upper frame of the drill, under the ratcheting feed wheel. This little frame extension fits underneath the upper end of the rocker arm - directly under the ratchet dog and feed wheel. A small thumbscrew is threaded into the frame extension. The thumbscrew presses against the bottom surface of the upper end of the rocker arm. By threading the thumbscrew in or out, the movement of the rocker arm can be increased or decreased as desired, to adjust the number of teeth that the ratchet dog will move the feed wheel with each rotation of the drill crank handle. 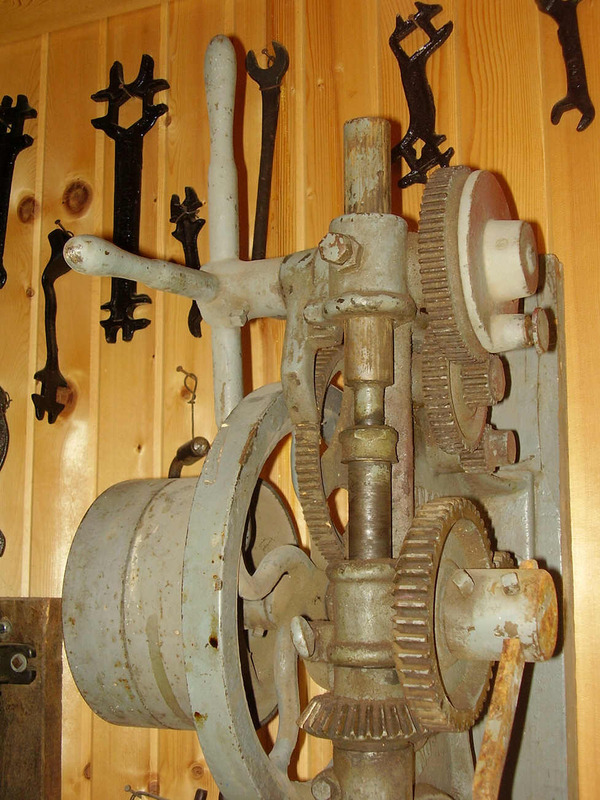 Movement of the feed wheel can be adjusted to move 1-3 teeth with each revolution of the drill crank handle. The crank handle adjustment screw is also clearly visible in the close-up photo (at far right). Loosening the set screw near the center of the gear allows the handle to be removed or adjusted in length. The Buffalo Forge Number 61 is a small post drill. Take a look in the photo (middle right). The number 61 is shown mounted to a wall beside the medium size Canedy-Otto Number 19 post drill. 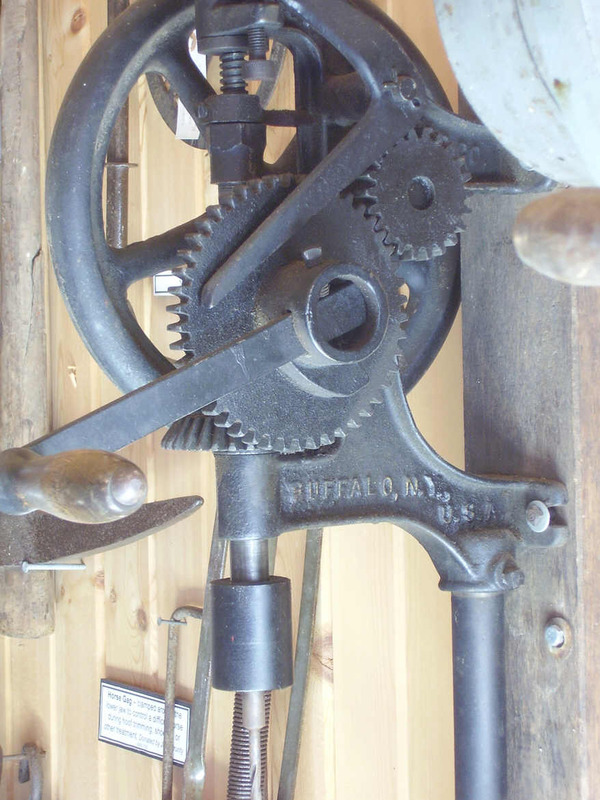 The Buffalo Forge number 61 was made for small drilling jobs in the home workshop or small farm shop. 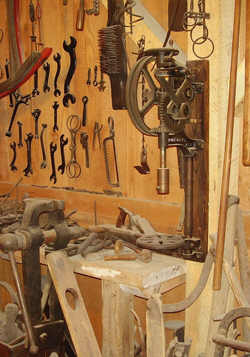 Scroll on down near the bottom of this page for a couple photos of a small farm home workshop - for an example of the setting where this drill might have been used. Model number of the drill can be seen in the photo (near right) by looking through the bottom right spokes of the flywheel. This drill is in great shape and appears to be almost complete except for the lower pipe frame bracket. The bracket appears to have been replaced or substituted with a wooden block, and this wooden block seems well designed for the purpose. All parts on this drill appear to work properly. Where to see this drill: Prairie Trails Museum of Wayne Country. Highway 2 East, P.O. Box 104, Corydon, Iowa, USA. www.prairietrailsmuseum.org Located on highway 2. Look for the red barn with the steam traction engine in front. Champion No. 98 Post Drill. 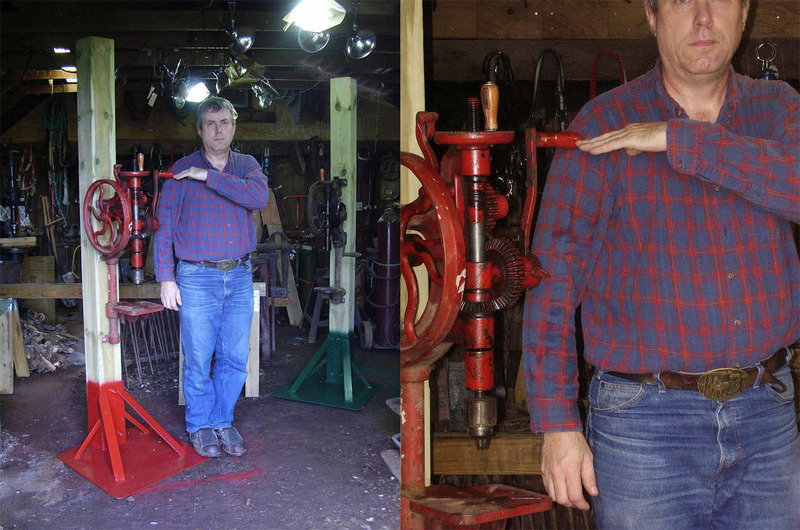 (Photos at left) The Champion Blower & Forge Company Number 98 post drill is one of Champion's smaller models and was designed for farmer's home workshops. The #98 is a single speed drill, self-feed, rated for drilling holes up to 1 inch diameter, length of vertical feed travel is 3 inches. The #98 will drill to the center of a 14-inch circle, thus making it a 7-inch drill press. Crank handle length is adjustable. The #98 accepts 1/2-inch straight shank drill bits and was also available by special order for use with 41/64-inch drill bits. About this drill: This drill is owned by the author. It was purchased for $65 at an antique tractor swap meet around 1999. More photos will be added later after this drill has been set up in the author's shop. The drill was in good working condition and was complete, no missing parts except for the chuck wrench. 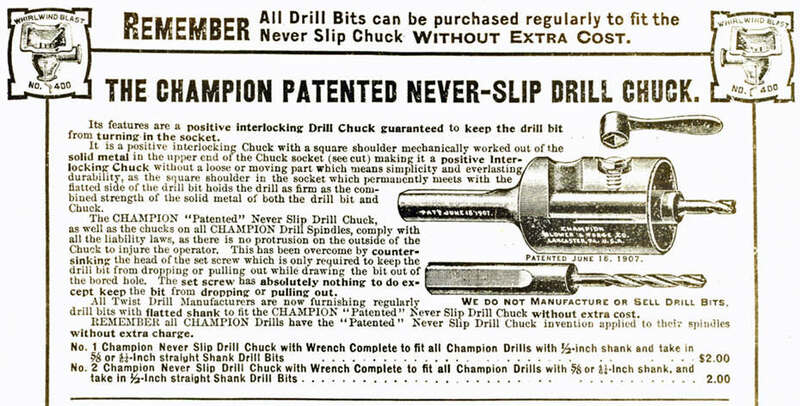 This drill appears to be an early model that was made before the introduction of the Champion Never-Slip Chuck. 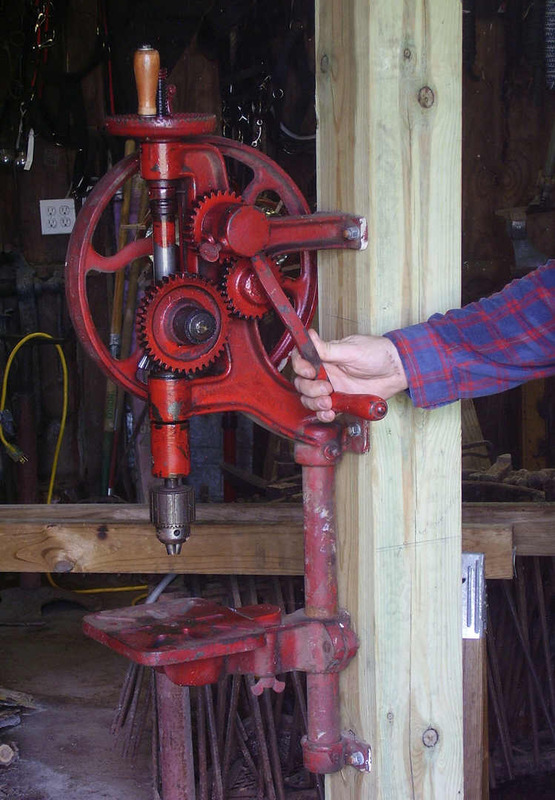 The chuck that was mounted on the author's post drill is a simple screw chuck that is identical to the red drill featured at top of this page. The chuck was in poor condition - the threads of the set screw hole were stripped out and the original set screw lost. The author re-threaded the set screw hole to a larger size and installed a cap screw temporarily in place of a suitable set screw. Table and table rest assemble. The table is fastened to the table rest with a single stud and wing-nut. The screw is actually a stud similar to those used to fasten engine cylinder heads to engine blocks. A short and very coarse thread size on one end threaded securely into the lobe on the drill press table, the opposite end threaded with regular coarse threads for the wing-nut. The stud is threaded tightly into the table lobe and does not turn. In the photos, the author hand is seen lifting and rotating the drill table. The stud is fixed immovably in the table lobe but can turn easily in the table support arm to allow table to be swung to the side. Table can be loosened and swiveled to the side to allow drilling wagon tires. The table support can be raised or lowered on the table support shaft and tightened in place with the single table support clamping screw. Photos at right show the table wing-nut removed to allow the table to be removed. Feed arm & drive gear. The feed arm of the #98 is held against the eccentric wheel by spring pressure. The spring is installed in the frame near the feed arm pivot bolt. Another bolt on the feed arm frame (on the front side of the feed arm opposite of the spring) provides limited adjustment of the self-feed. A wheel is riveted to the lower end of the feed arm where it rides against the eccentric wheel. The eccentric wheel is built into the hub of the drive gear on this drill. 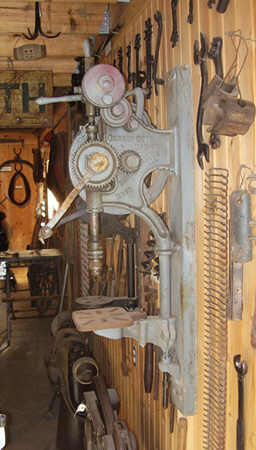 The Number 200 drill shown here is mounted on a wall of a blacksmith's shop. It is in beautiful condition and appears to be complete (no parts missing). The blacksmith/owner uses this drill every day. A wood block has been placed on the drill table by the smith for drilling small objects. 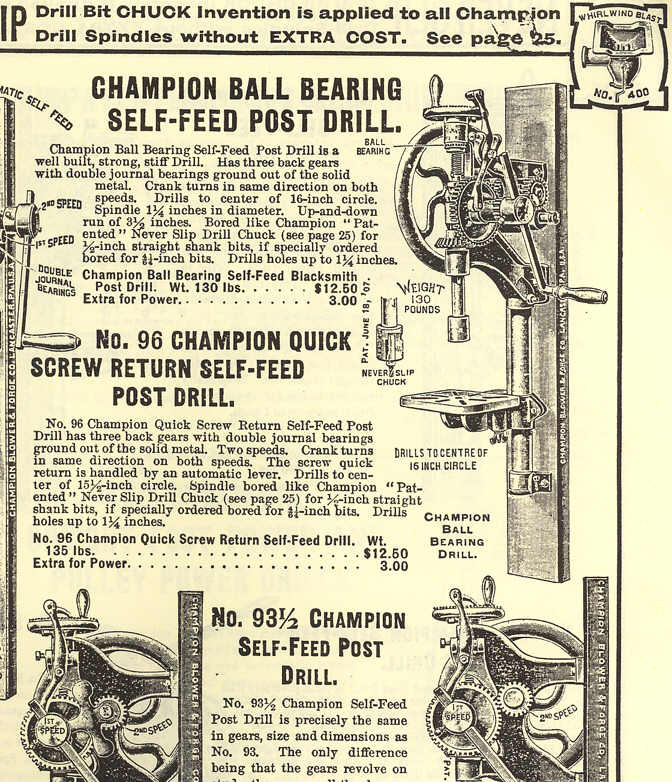 The #200 shows up in Champion's 1909 catalog so I estimate the age of this drill is probably around 100 years old. Where to see this drill: Old Thresher's Reunion grounds, Mt. Pleasant, Iowa, USA. 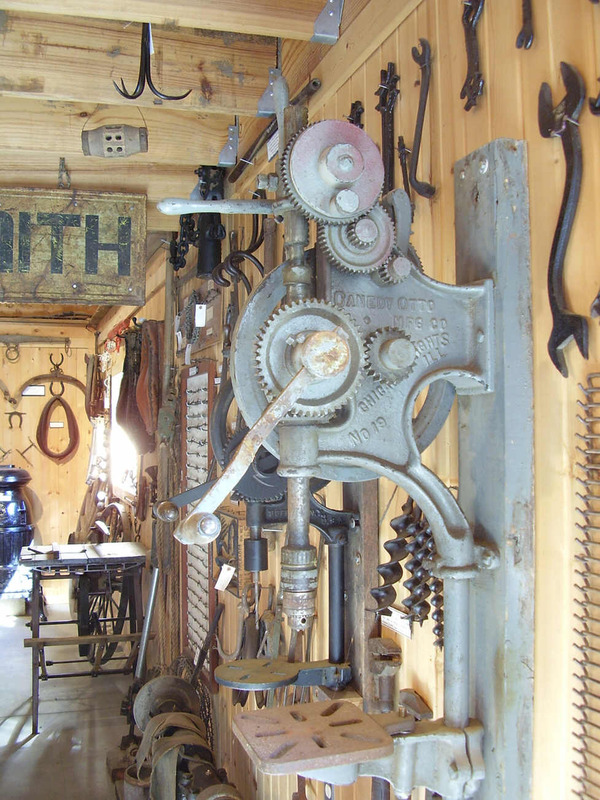 The drill featured here, is privately owned, and can be seen at the blacksmith shop in the North Village. Champion Blower & Forge Company Catalog 1909 reprint. 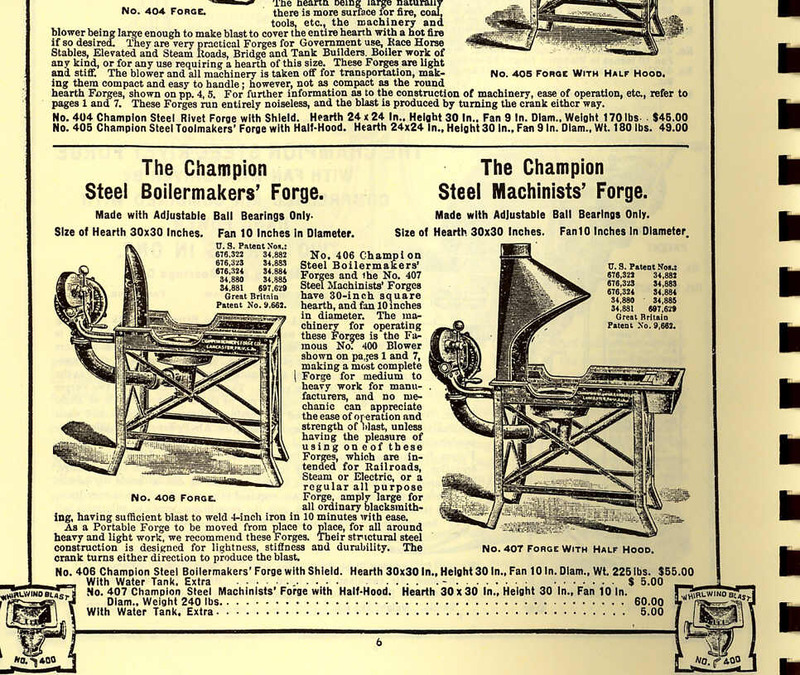 For anyone interested in Champion Blower & Forge Company products, I recommend buying a reprint of The Champion Blower & Forge Company Catalog circa January 1909. Reprints of this catalog can be purchased from Centaur Forge http://www.centaurforge.com/ in their Metalworking Reference Materials Book selection: http://www.centaurforge.com/Metalworking-Reference-Materials/products/260/ , Burlington, Wisconsin, USA. The catalog shows all of the company's products that were made in 1909. Drills, forges, blowers, tire bending and shrinking equipment, taps and dies. This is an excellent source featuring some of the best tools of the era. The catalog includes a cutaway drawing of the internal working parts of the Champion 400 blower - the best hand cranked ball-bearing forge blower ever made! 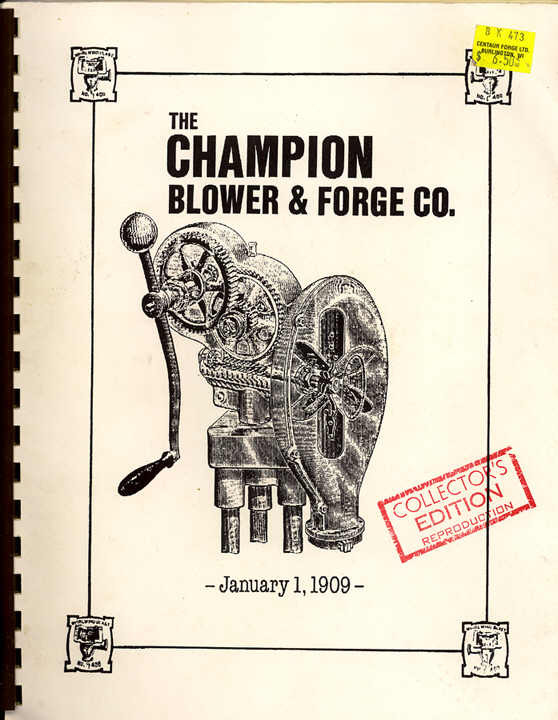 The Champion Blower & Forge catalog of 1909 is an excellent reference for identifying and inspecting these old tools and all of their parts. Champion made some of the very best tools and these tools are still used in many blacksmith, horseshoeing, and repair shops today. Canedy-Otto Manufacturing Company catalogs. Here are two Canedy-Otto catalogs that can be downloaded and viewed in Adobe Reader. These are PDF files. The first catalog (near right) is the Catalog Number 8, and this catalog is complete. The catalog number 8 shows everything available from Canedy-Otto at that time including; forges and hoods, blowers, post drills, and floor model drills. The second catalog is a partial copy of the Catalog Number 12 (at far right). The second catalog is not complete - it is a partial series that shows only drills made by Canedy-Otto at the time. The first half of both catalogs show the products that were available from the company, and the second half of the catalogs lists parts for all of the products in the catalog. Canedy-Otto Number 18 Post Drill. The large drill in these photos (photos at left) is a Canedy-Otto #18. The #18 is a very large post drill that will stand over 6 feet tall when mounted to a post or wall at a comfortable working height. The #18 is similar in size and design compared with the author's New #16 shown on the restoration page at Canedy-Otto New No. 16 Drill. Both drills still have their original Western Chief Safety Chucks, and the #18 has an old Jacobs chuck fastened in the Safety Chuck, thus allowing the drill to accept modern drill bits. 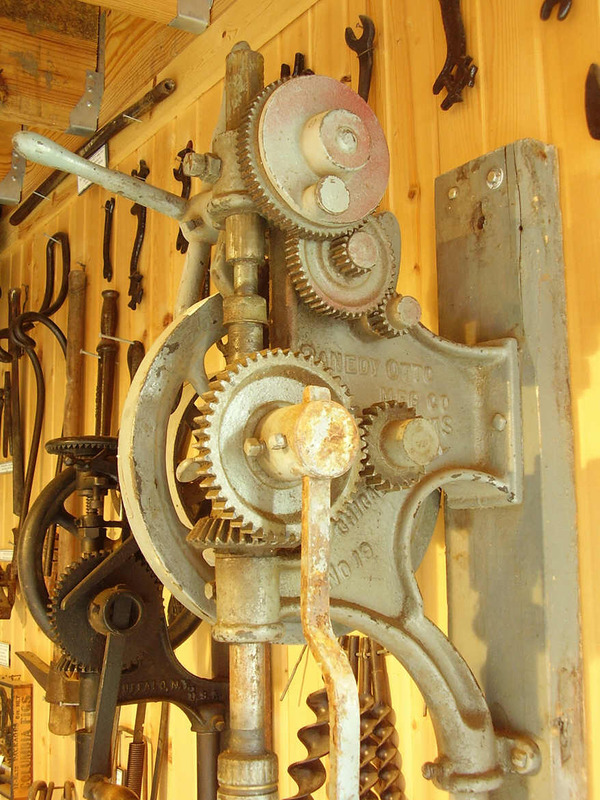 The chuck key is tied to the Jacobs chuck arbor with wire to prevent its loss while the museum prepares to move this drill to a more permanent display. I could not positively identify the smaller drill in the photo but I did notice that the smaller drill uses the same Canedy-Otto Western Chief Safety Chuck as the #18. The Canedy-Otto Number 18 weighed approximately 400 pounds. Back gears allow quick speed changes and multiple drilling spindle speeds. 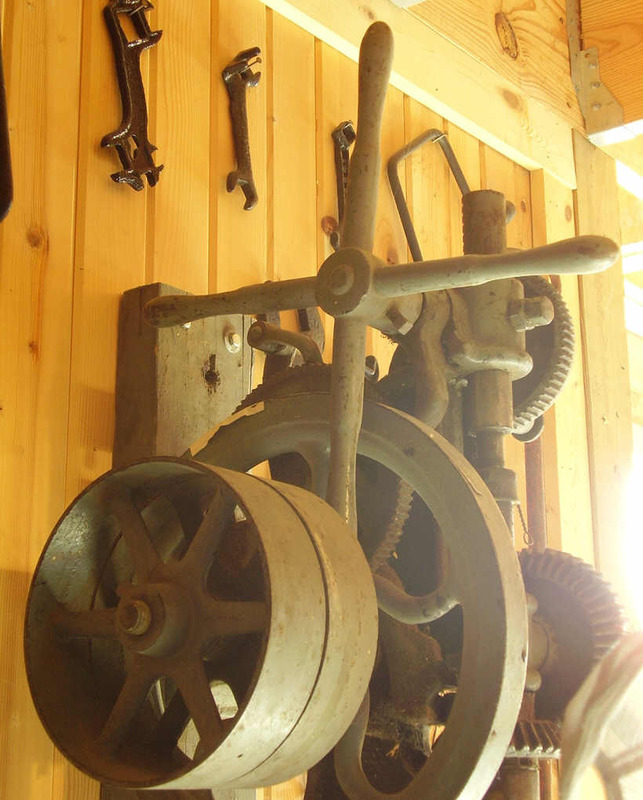 Free and fixed pulleys allowed the Number 18 to be powered by line shaft in the shop, and a hand crank allowed the drill to be powered by hand when the line shaft was not running. 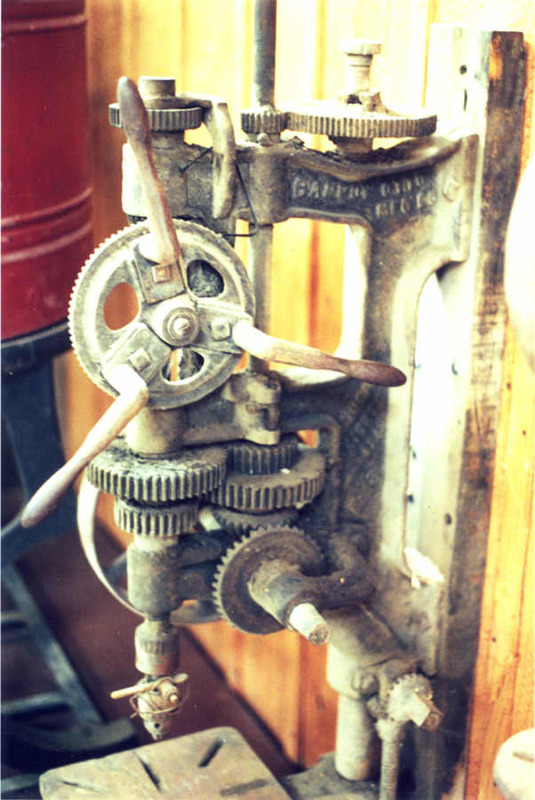 A feed handle with three arms allowed the operator to apply feed pressure by hand while the drill was operating on line shaft power - thus allowing fast operation similar to the modern motorized drill press. Both drills described here (photos at left) are incomplete - missing parts. The larger #18 is missing the big flywheel that was originally attached to the top of the vertical shaft (at top of the drill). The small drill is missing the feed wheel - the feed wheel would have been located on top of the drill spindle. 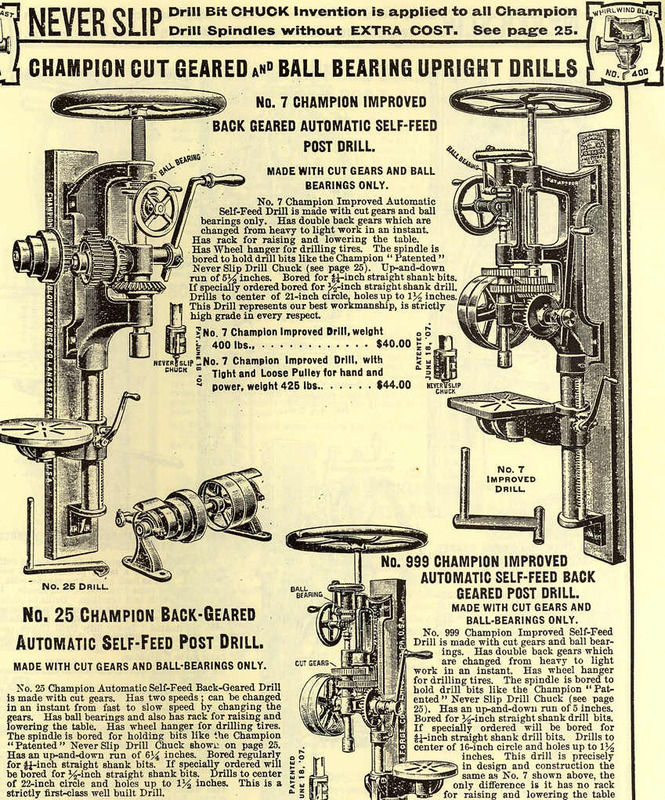 Compare the the larger drill at left, with the Champion drills in catalog images above. The larger Champion drills have a large horizontal flywheel mounted on top of the drill - this flywheel is missing from the Canedy-Otto drill at left. 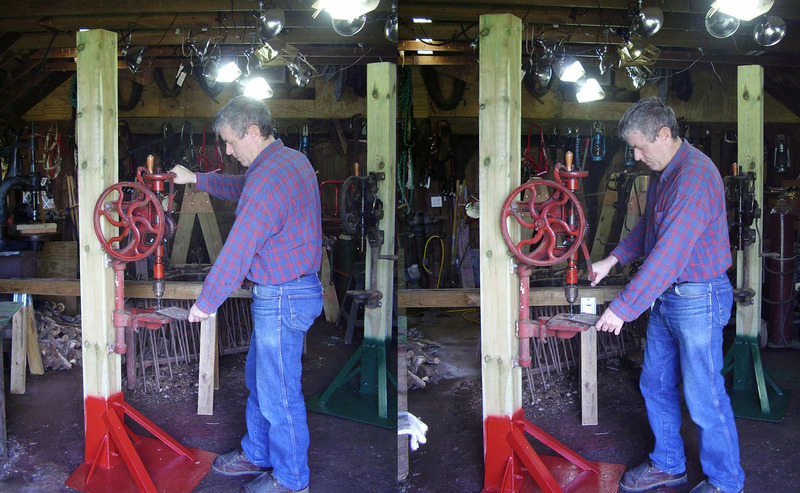 Also compare the smaller drill at left, with the farmer's workshop drill at right. The horizontal spindle feed wheel and handle are clearly visible on top of the drill in the photo at right. When buying an old drill, it is important to inspect the tool to be sure all parts are present and intact. Farmer's home workshop. 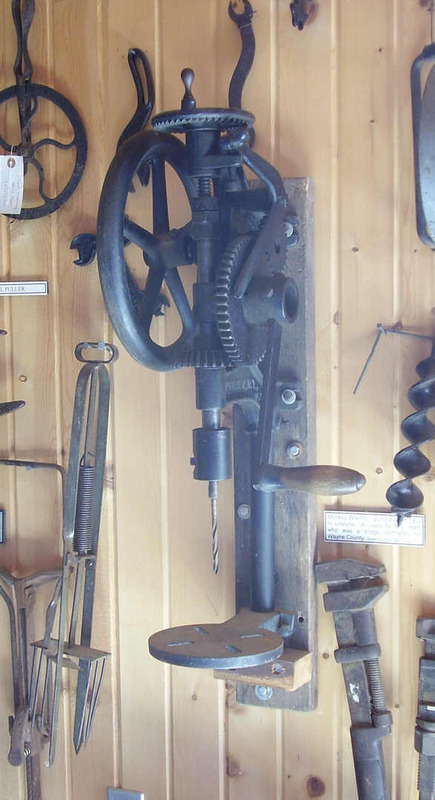 Another small hand cranked drill (photo at right) is found in the farmer's shop exhibit in Museum A. The thumbnail photos at left show the entire display as it might have appeared in the farmers barn or work shed. 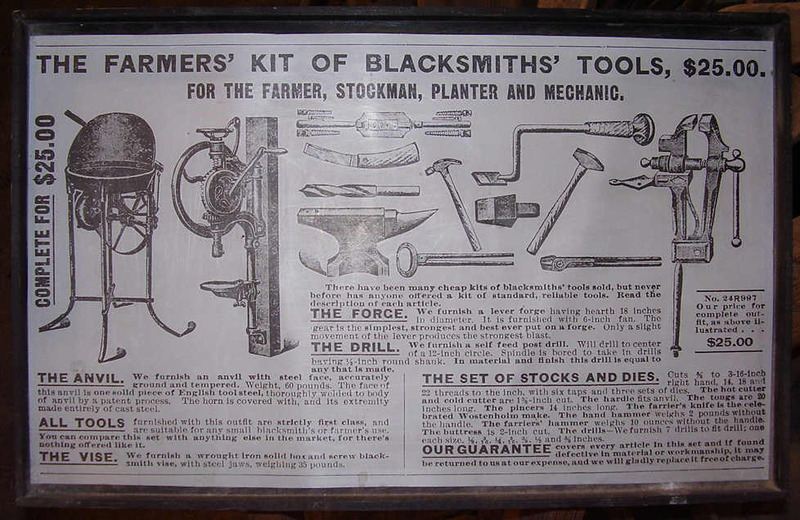 Small post drills were often purchased by mail order as part of a tool kit along with some small blacksmithing tools. 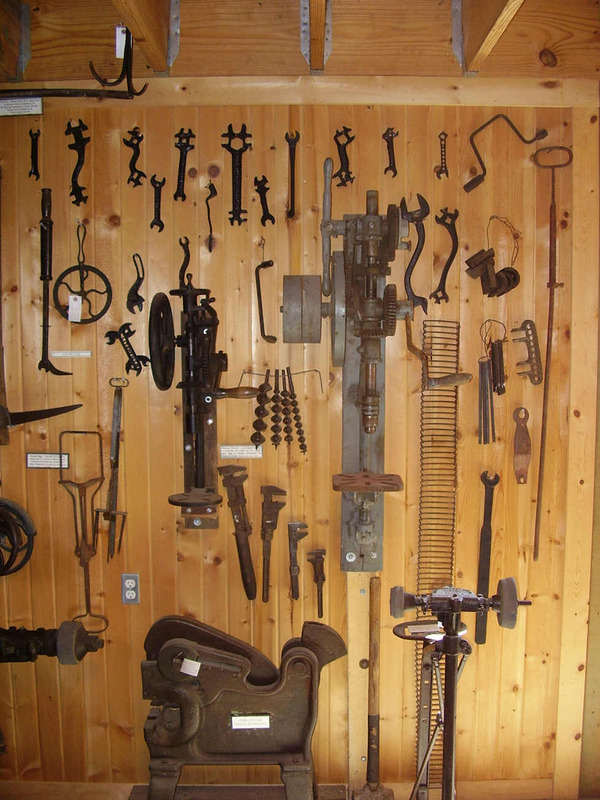 These are just a small sample of some of the hand tools that would have been found in a small workshop on a farm around 1900. 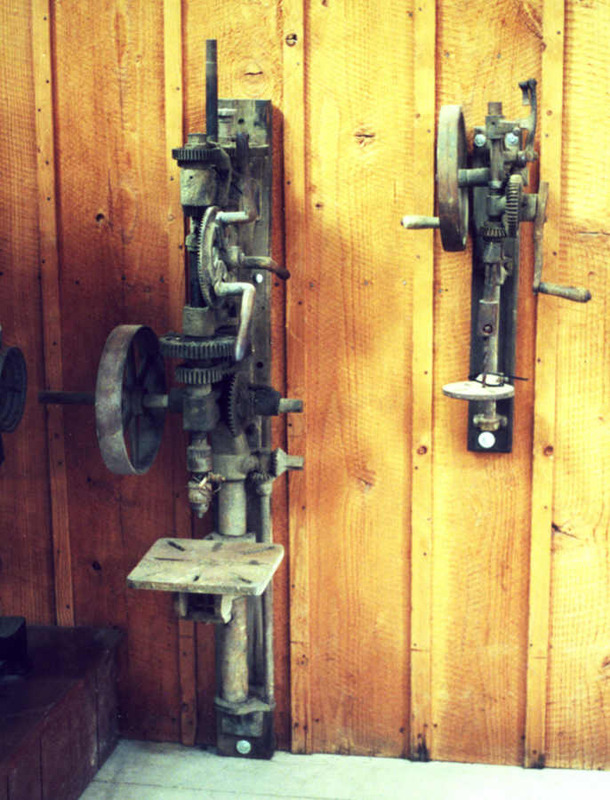 There are hand cranked post drills in almost every workshop at Old Threshers. Before the era of electricity, the hand cranked drill offered the simplest and easiest way to perform small drilling jobs. 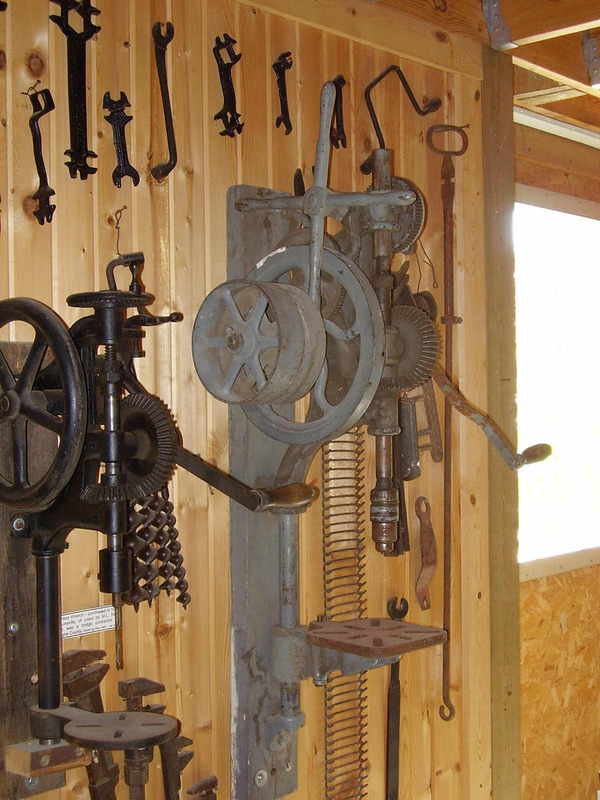 Visitors will see these drills in use throughout the Old Threshers museum displays and living history workshops. 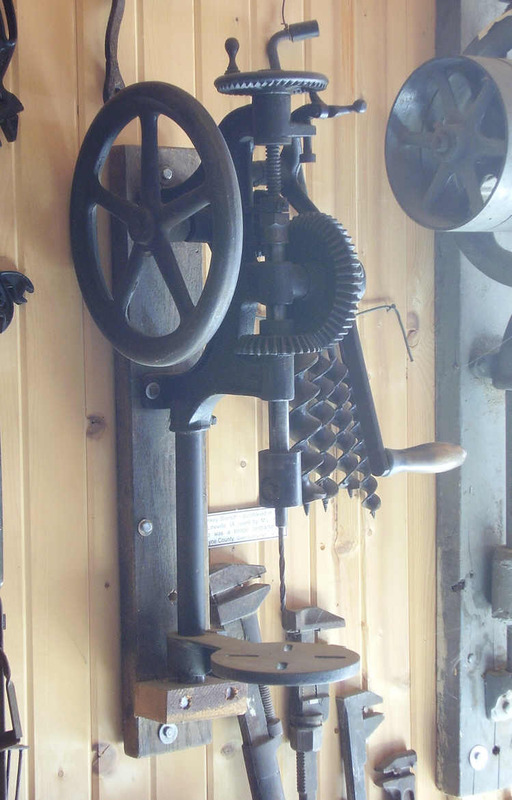 Where to see these drills: Old Threshers grounds, Heritage Museum A. The museums are located near center of the park. Latest update December 27, 2015. Attention stupid! Working with old machinery is Not for amateurs! Due to the age of these drills, most parts are unavailable and must be made by a competent machinist. These drills are obsolete! Many of the original manufacturers have gone completely out of business or have changed ownership and no longer stock parts for the old drills. Buyer beware! You are on your own if you buy one of these old drills. There are no longer any parts made for these drills. If you break something, then you manufacture your own parts. If you have a problem with making your own parts then DON'T buy one of these drills. Are you an idiot? Are you a moron? Are you too stupid to understand this? I can't help you if you buy a broken drill. In fact I just don't care. If you buy one of these drills and it doesn't work and you aren't skilled enough to figure it out on your own, then don't bother me because I can't help you. These drills are for experts that can figure these things out on their own. Not for morons that buy broken tools and expect everyone else in the world to help them for free. If you have to ask me how to do it, then you haven't got what it takes to repair one of these old drills.